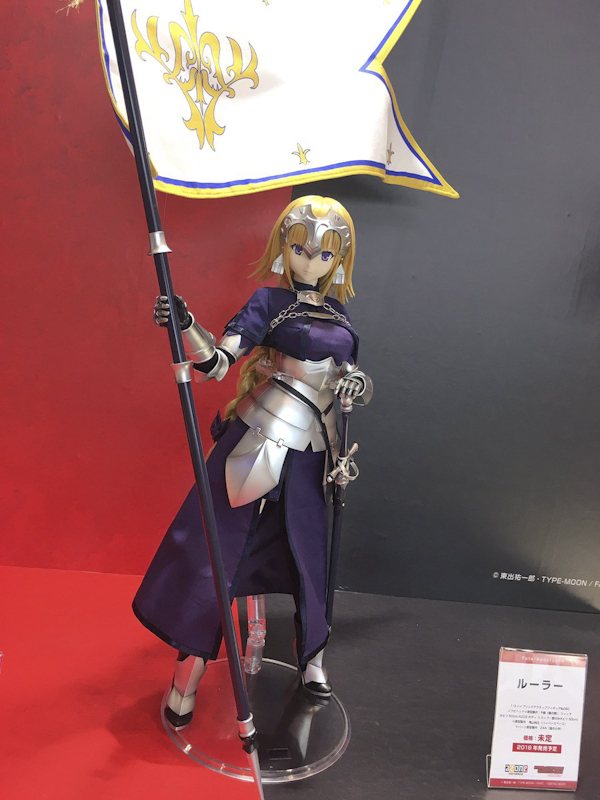 Wonder Festival 2017 Summer took place on July 30, 2017. 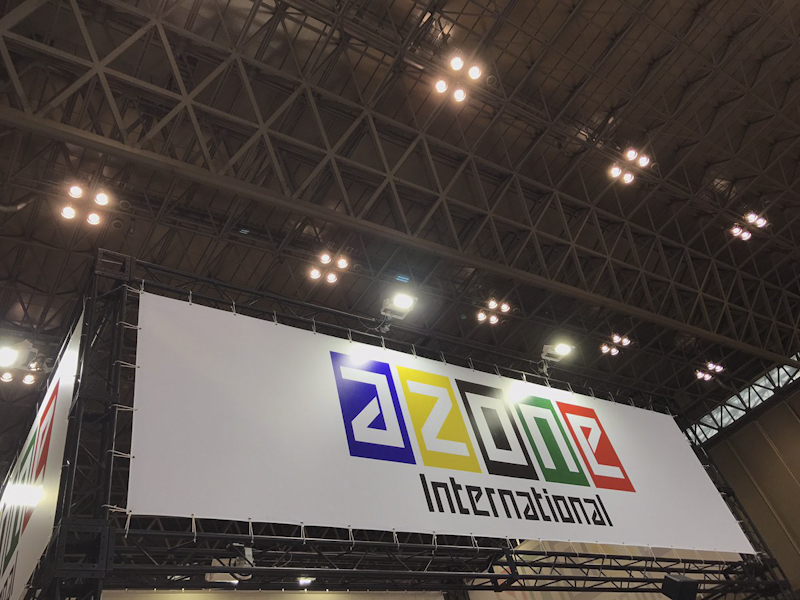 Azone International was in attendance. 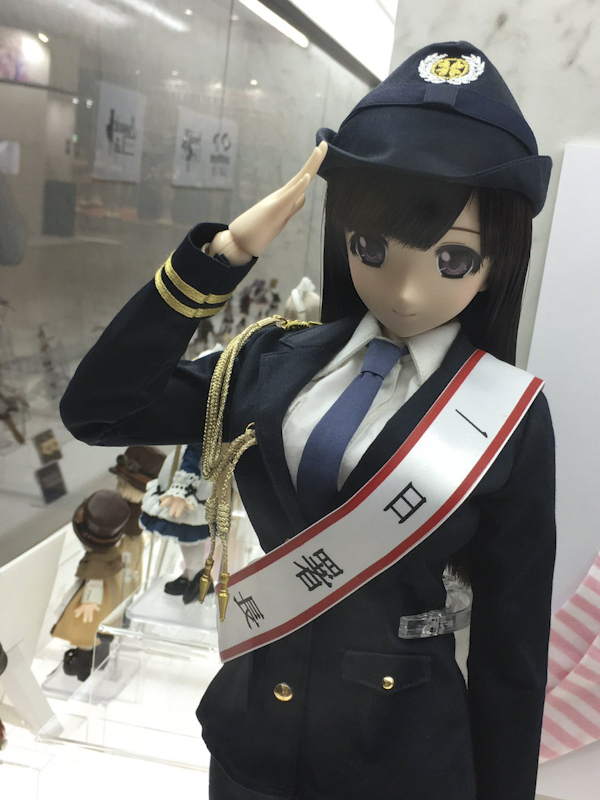 They displayed a lot of amazing dolls. 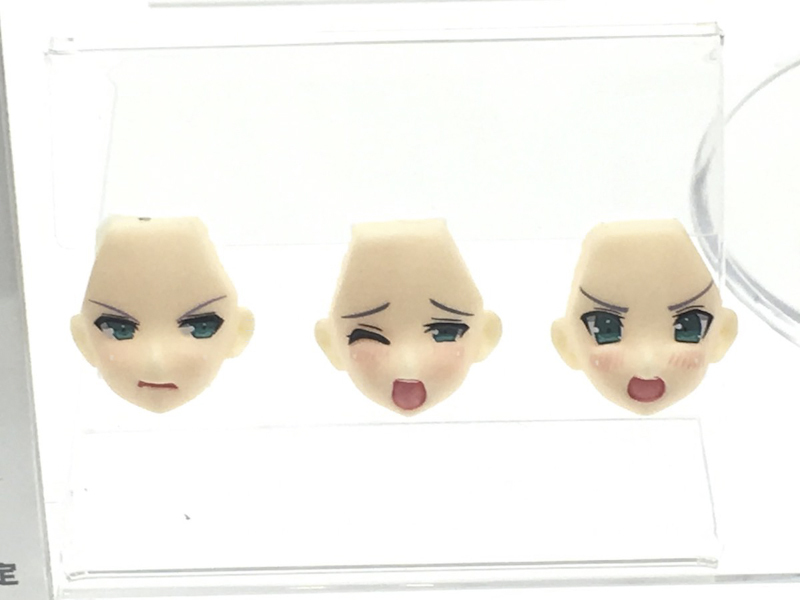 Ah, these KIKIPOP! girls are too cute for words. I would love to have all 3 adorable waitresses wait on me in their KP Diner. Cream Soda (blue hair) and Cherry Pie (golden blonde hair) are regular release girls. Orders start September 5. While Pink Cream Soda (blonde hair) is an exclusive. She'll be at the KIKIPOP! Fest2017 in Harajuku on September 16 -18. The EX-Cute family & friends are always a favorite. 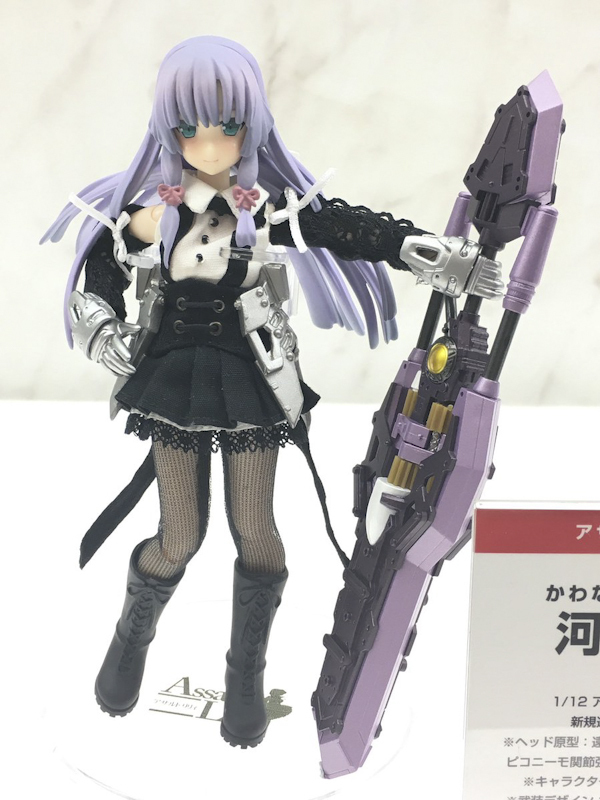 I'm curious as to what prompted Azone to transformed Mia into a meow x meow kitty too! 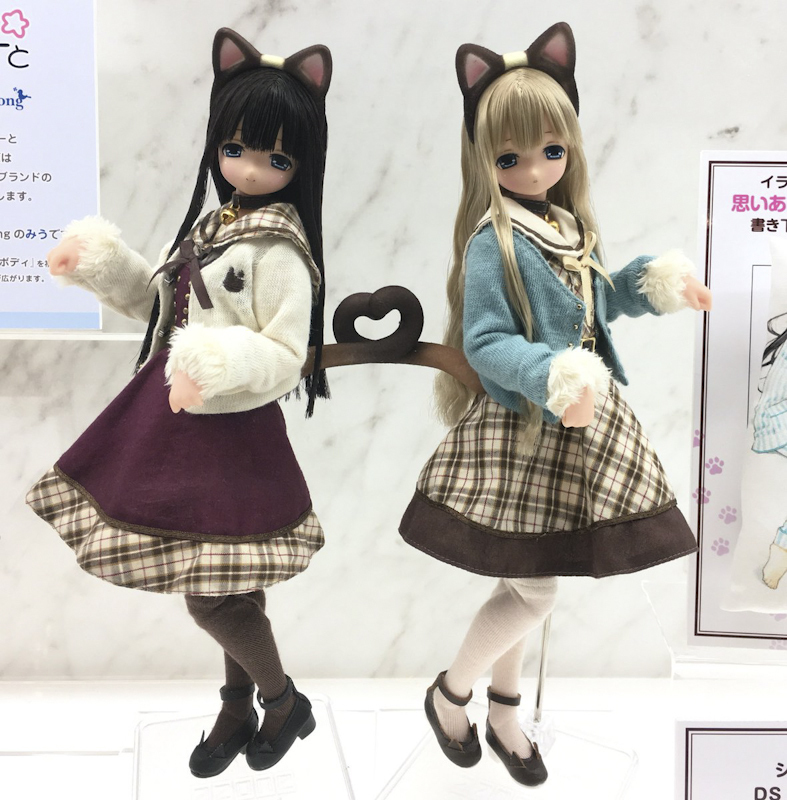 I would love to get my hands on the Mia Siamese Cat Doll Show version (blond, wavy hair). I mustn't get her. . . . 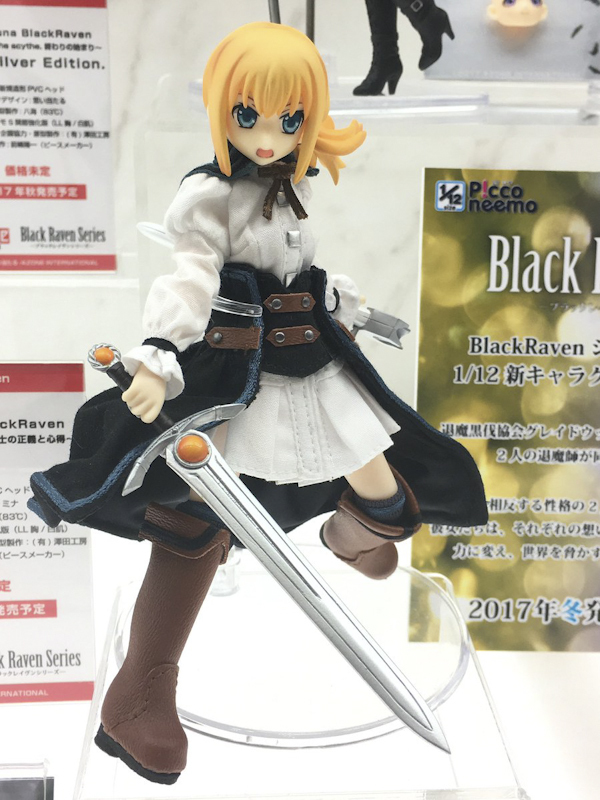 I must get her! I have a tough dolly decision to make. I am excited to meet the newest members to the Lil' Fairy series. 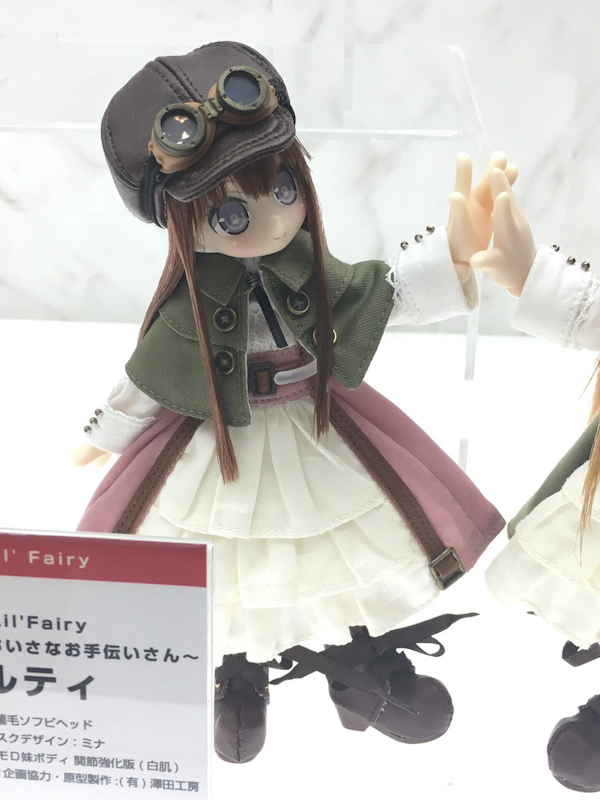 I have a soft spot for those teeny tiny fairies (bye-bye money). I want both of them but I'll most likely get 1 . . . but which one? I don't know! 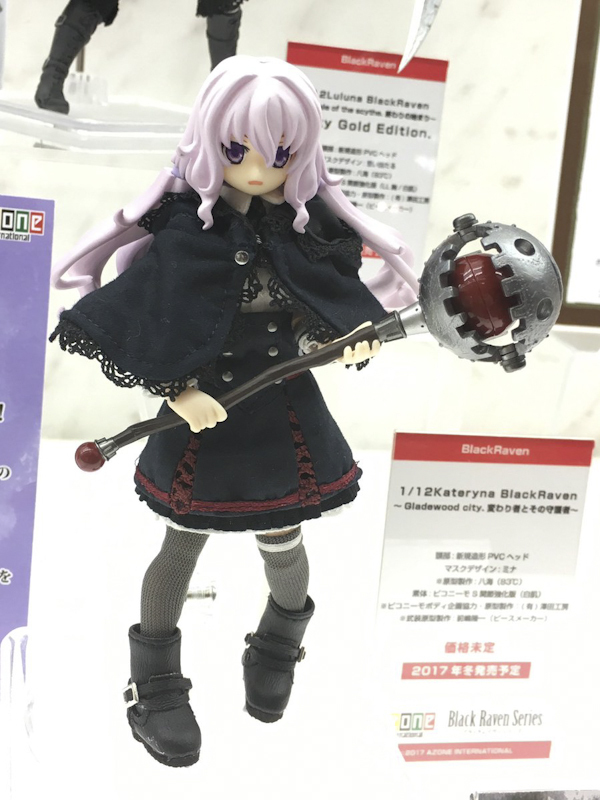 Man, more dolly decisions to make this winter. 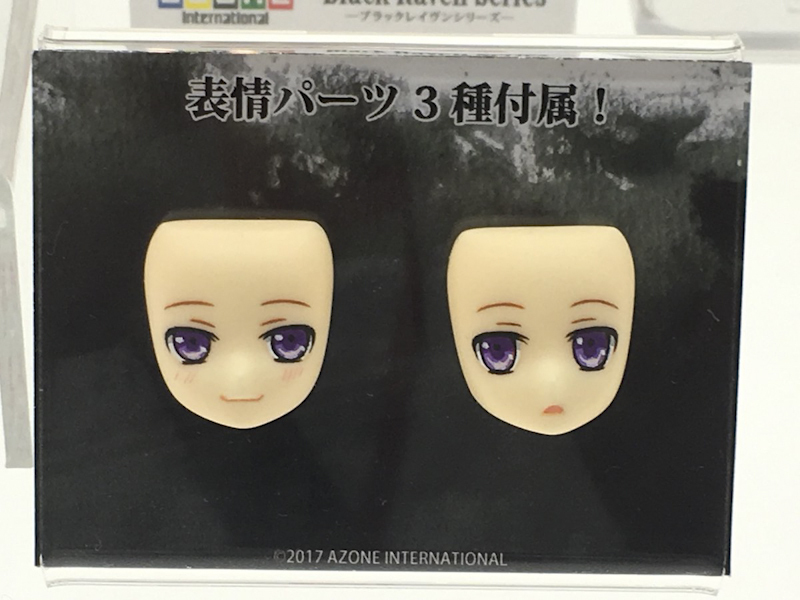 The fans voted and Azone is bringing back 3 of the previously release Lil Fairies: Riam, Erunoe and Vel. After 2 years, all 3 fairies are as cute as ever! 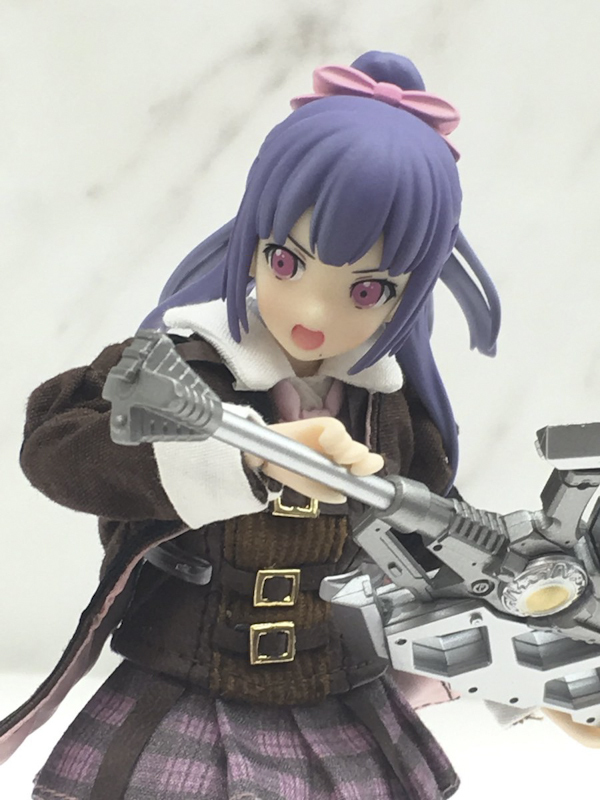 The 1/3 scale girls are trying to breakdown my resistance. 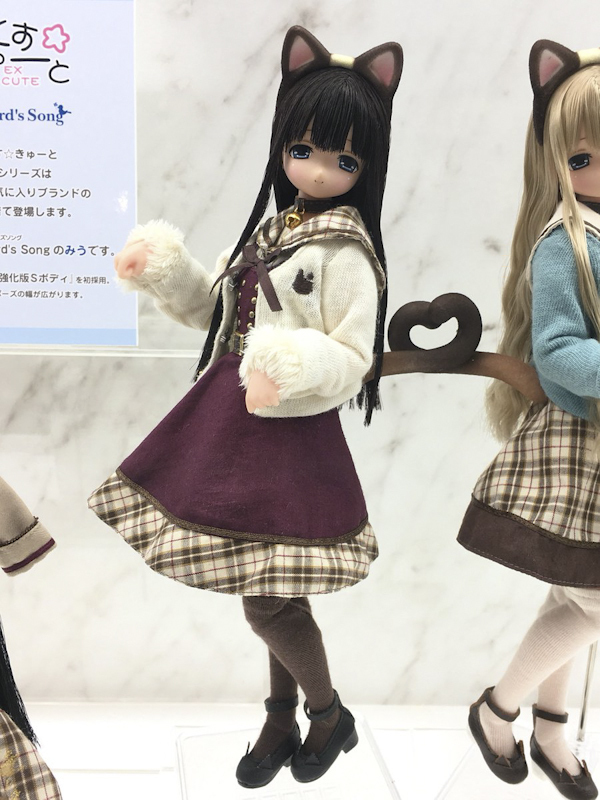 I'm loving the new improvements to the Pure neemo and Picco neemo bodies. 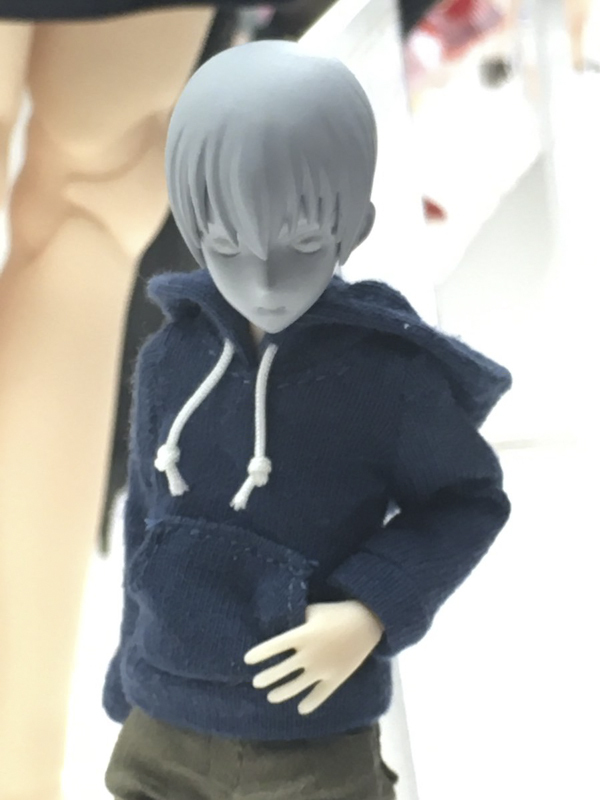 I wonder which boy will have the new body type. 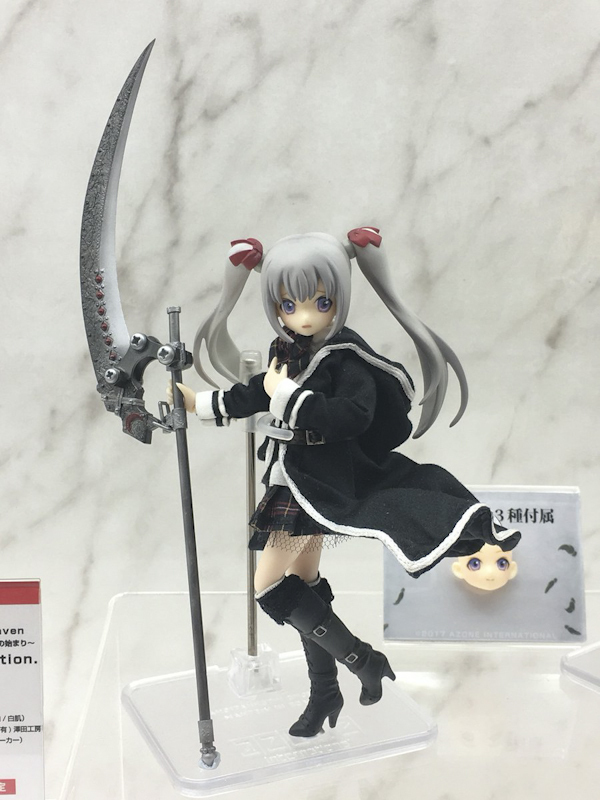 What do you think about Azone's Wonder Festival booth? Were you impressed or was it lacking something? Who are you looking forward to adding into your collection the most? 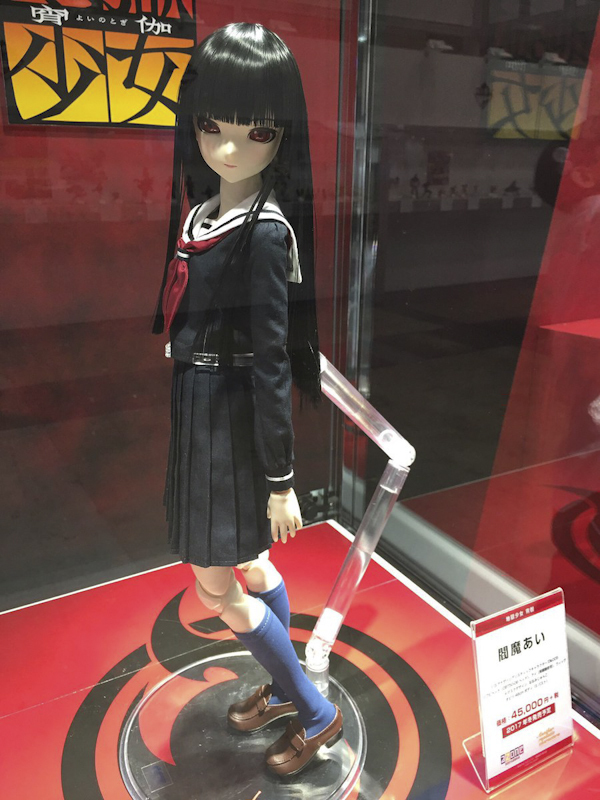 And which girl or boy were you surprised to see on display? 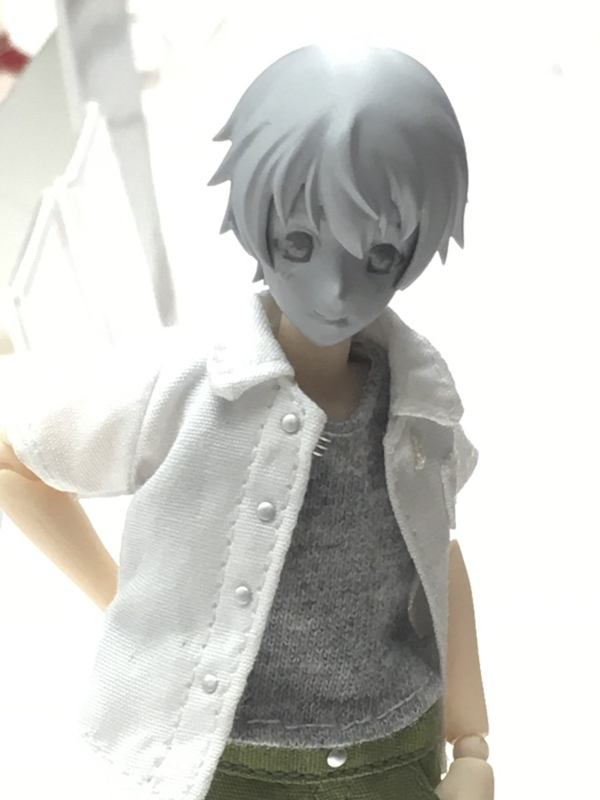 I look forward to chatting with you about Wonder Festival 2017 Summer. There are too much dolls! 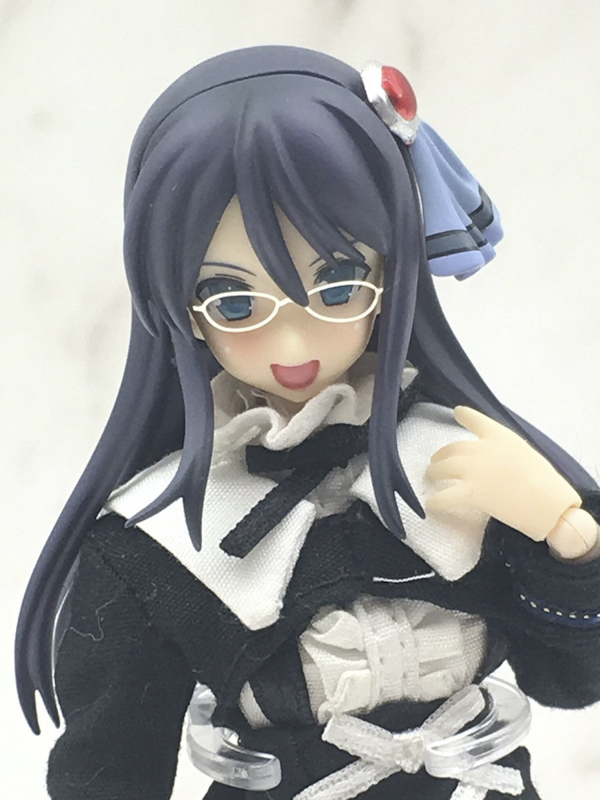 My…! 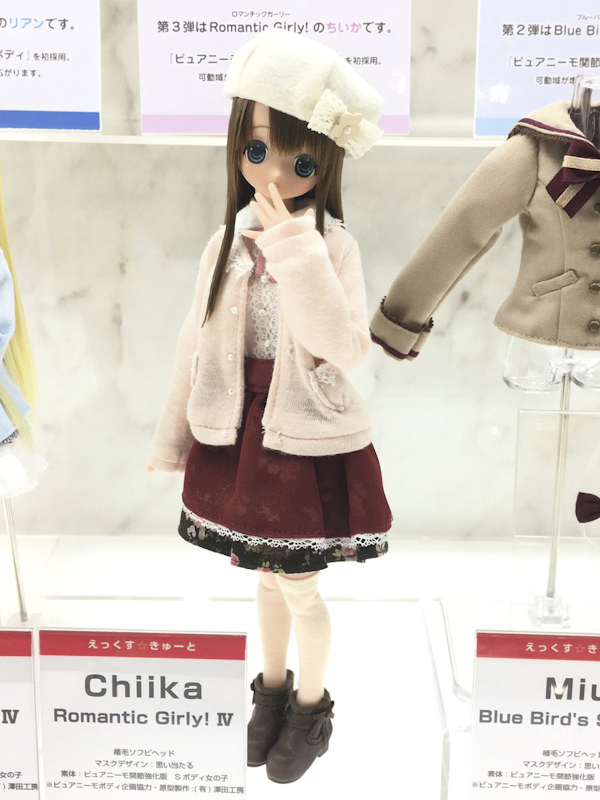 Even if casual clothes aren’t my cup of tea I really like Miu Blue bird song and Chiika. 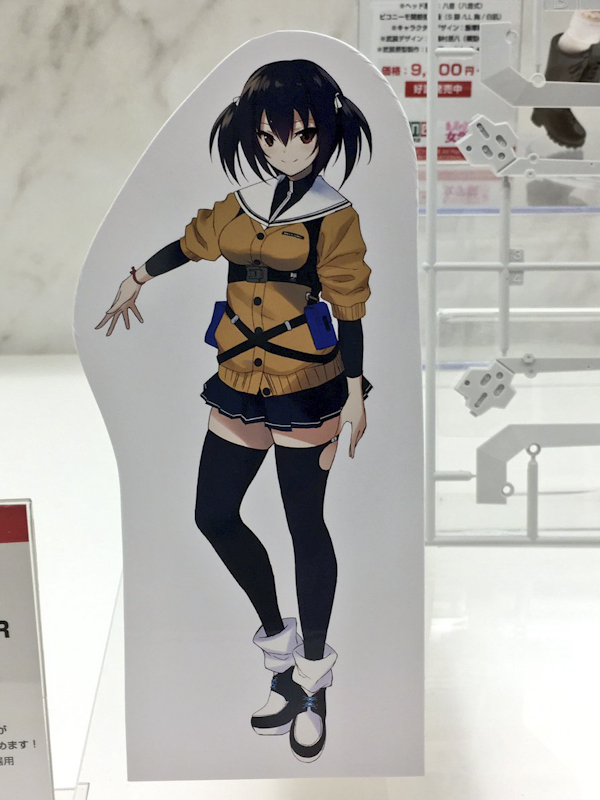 I wonder how she looks without her jacket. 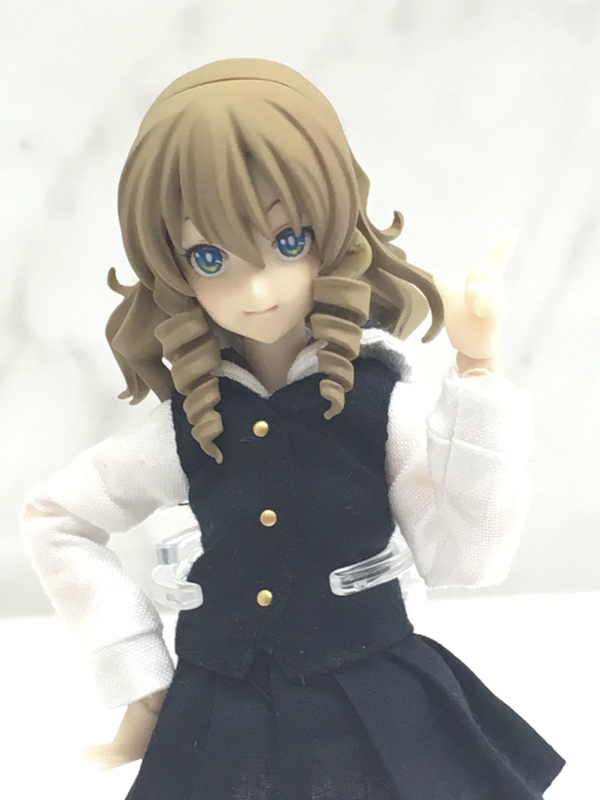 I can’t wait to see Yui. There’s something about her that’s drawing me in. 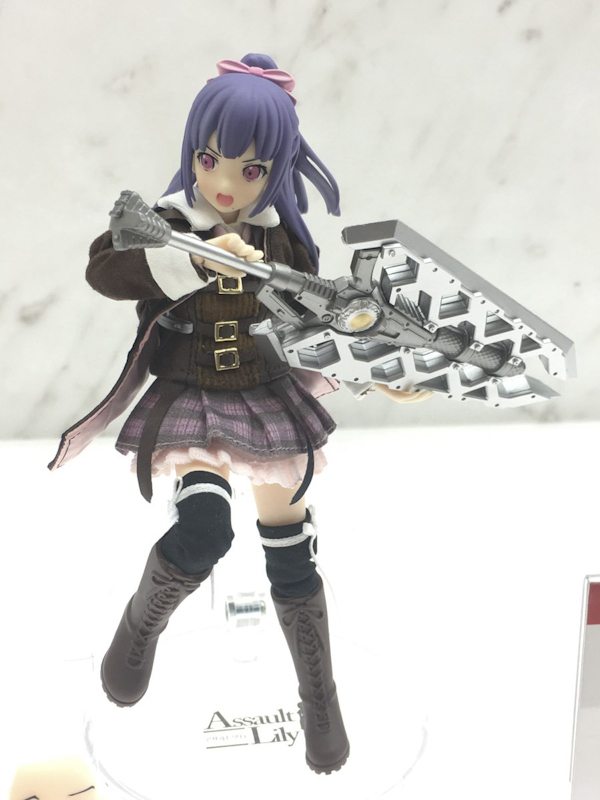 Sadly, it looks like Azone doesn’t believe in breaks. 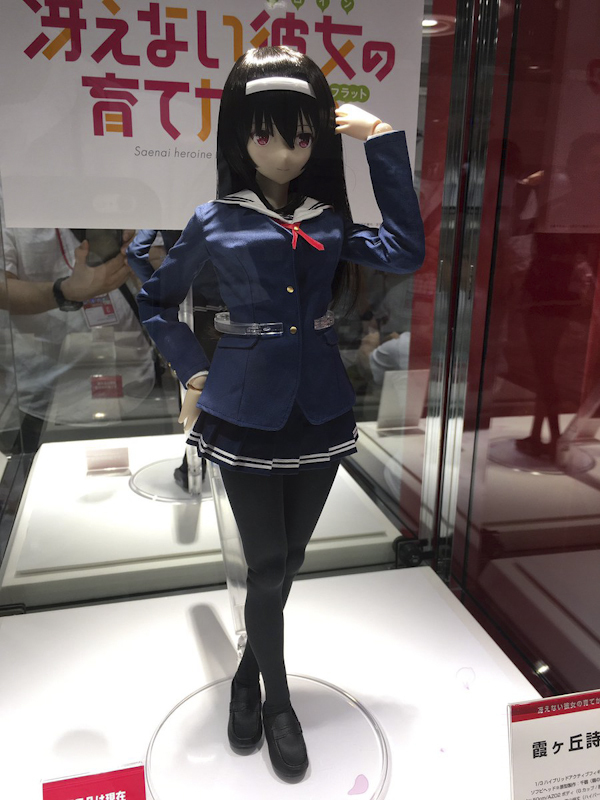 Thanks for sharing your thoughts about Azone’s Wonder Festival Summer 2017. You are the 2nd person to bring this to our attention. Which Neilly or Lipu are you referring to? 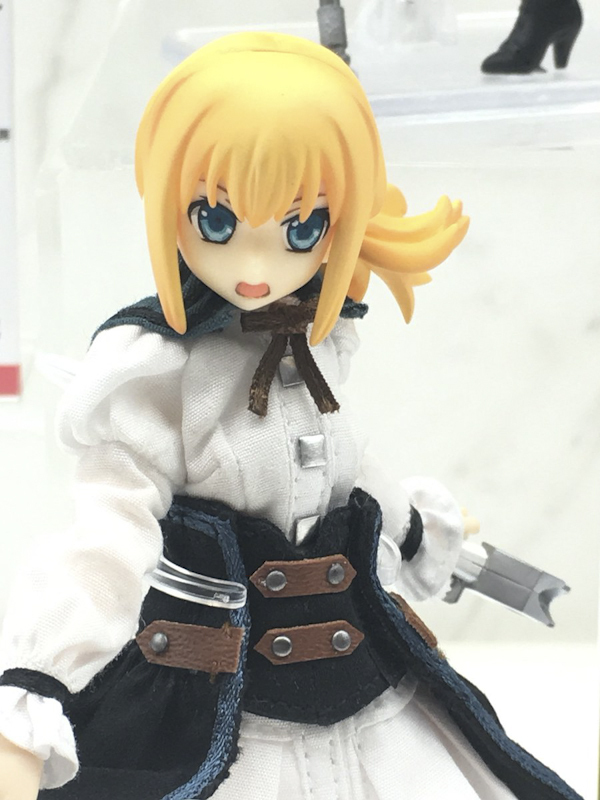 Right now, I don’t believe Azone has re-released Lipu or Neilly. But I may have missed this news. Yes, if you purchase the Fan’s Voted: Vel, Erunoe and Riam your collection will be incomplete. 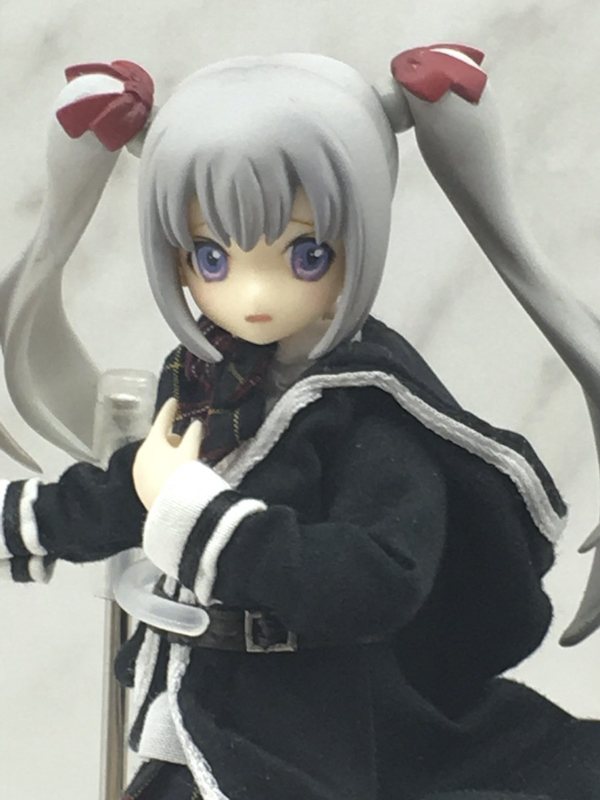 Azone is not re-release Neilly or Lipu. 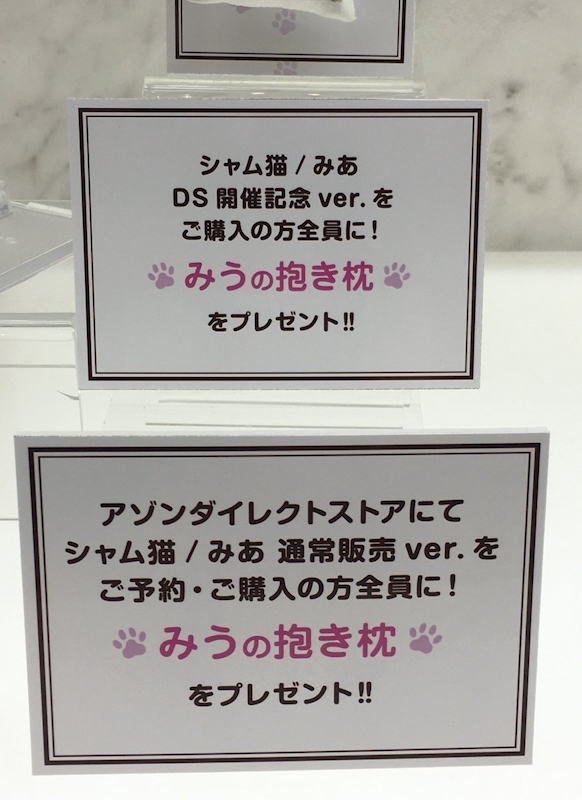 I want the meow x meow Mia DS ver. But I don’t understand how does direct store dolls work? 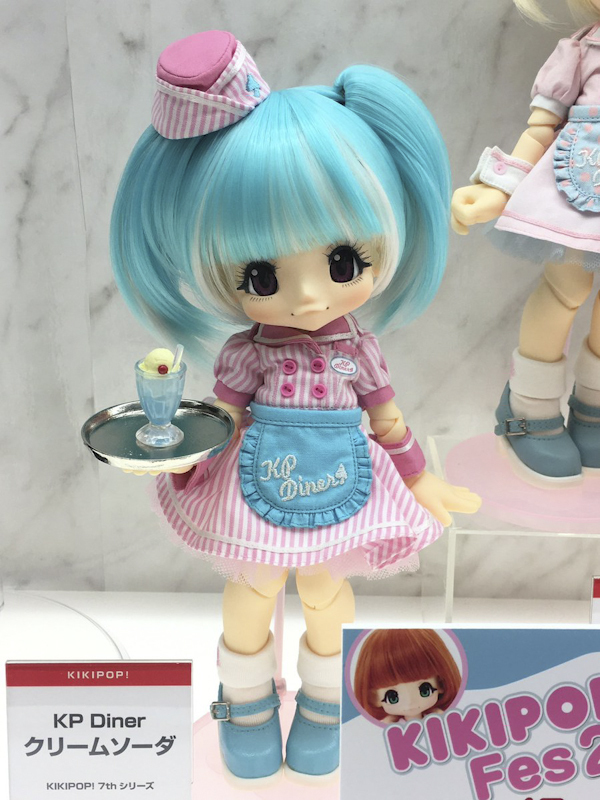 Also same for kikipop kp diner (pink dress). 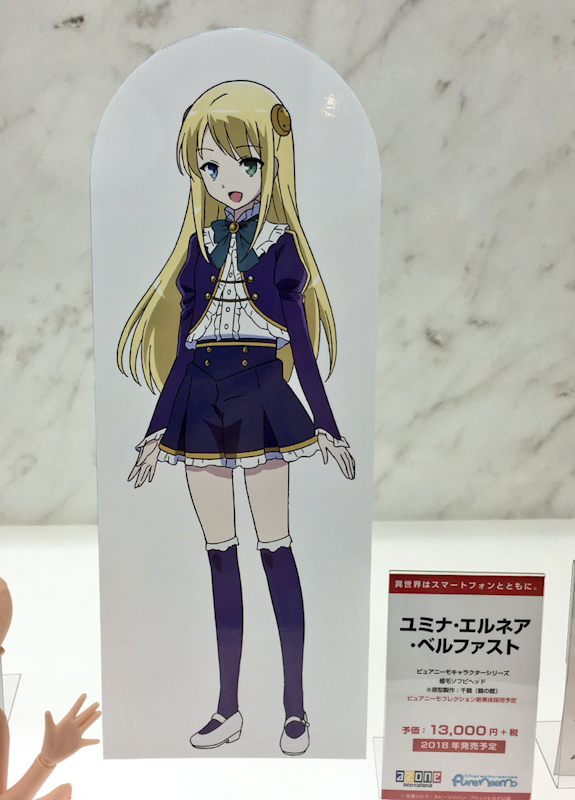 It’s said that she’s limited at the event. 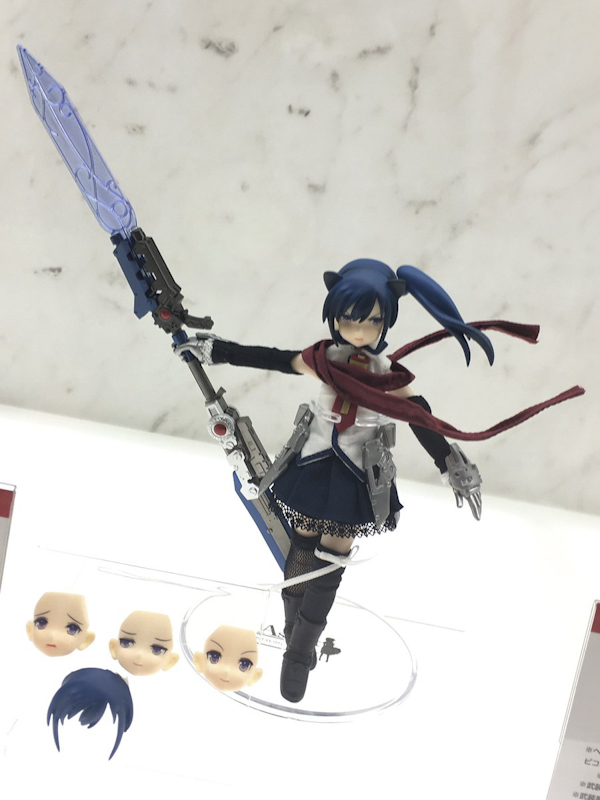 Will she also be available online? 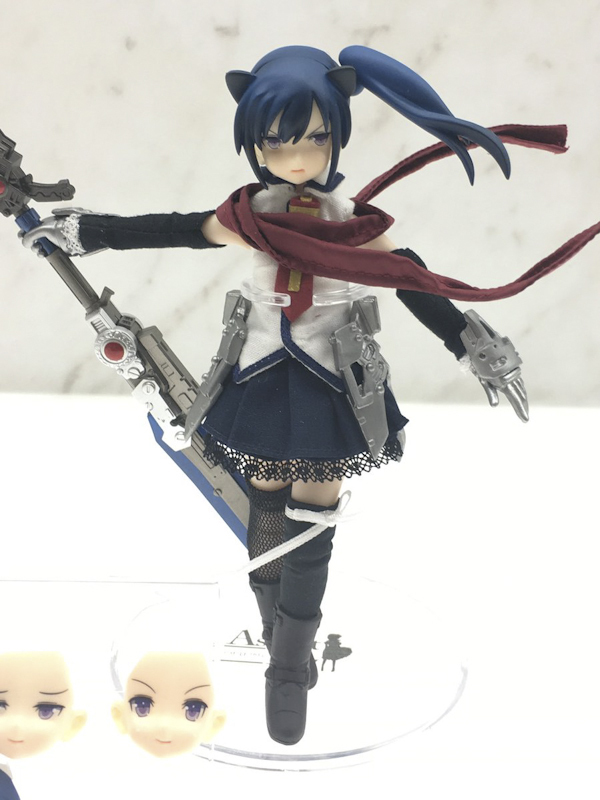 Can anyone suggest where I can possibly find her once she’s been released. 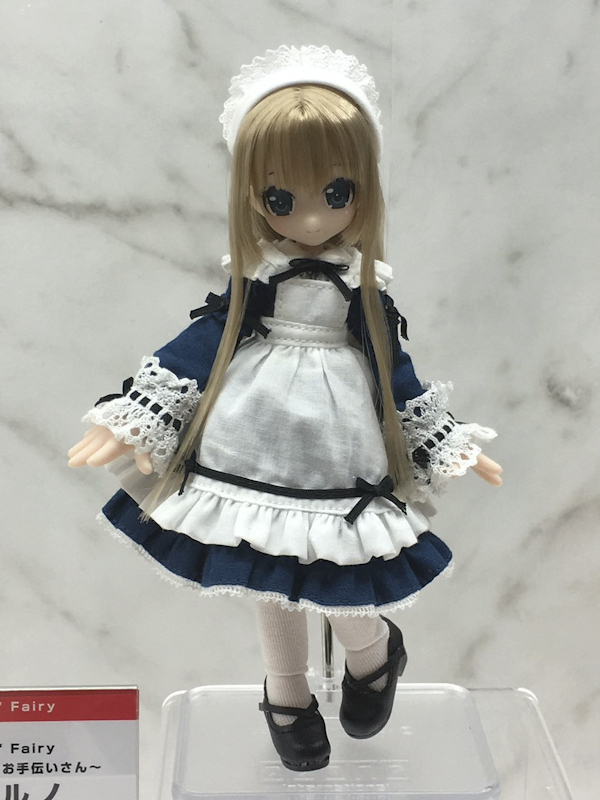 Event dolls and direct store ones generally only show up online in the second hand market. You can probably use a proxy (or if you know someone in that area of Japan, ask them!) to buy them, but I’ve not gone that route. 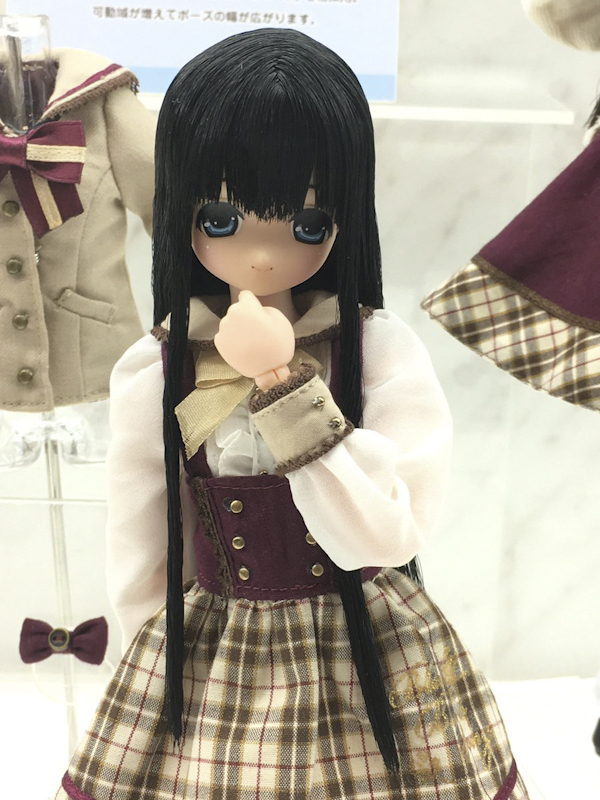 However I’ve picked up one (or two) direct store Azone dolls second hand before (my favourite haunts are generally AmiAmi and Jungle SCS. 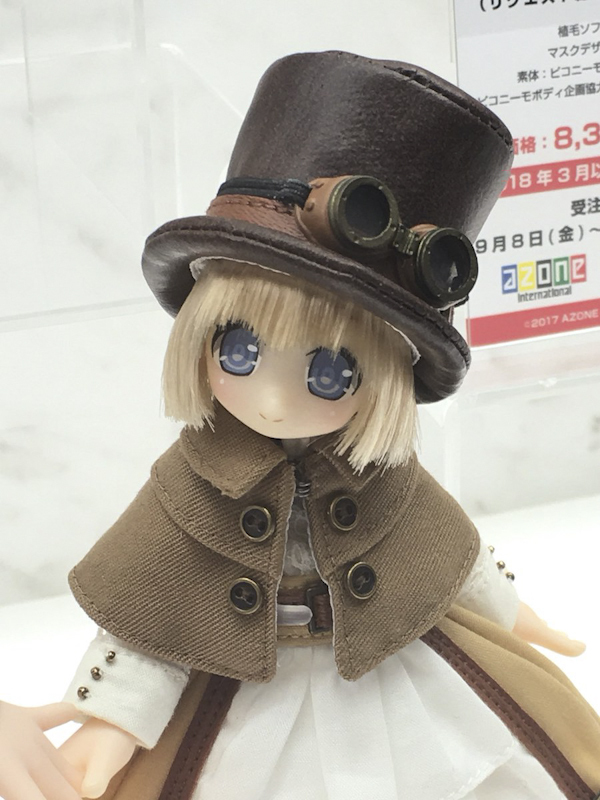 Mandarake is also popular). 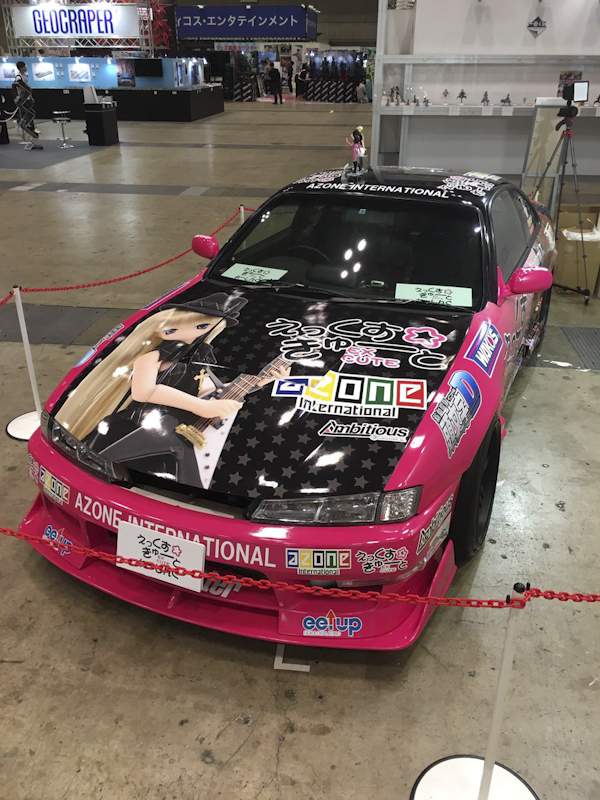 So you may need to steel yourself to wait for people selling her later on. 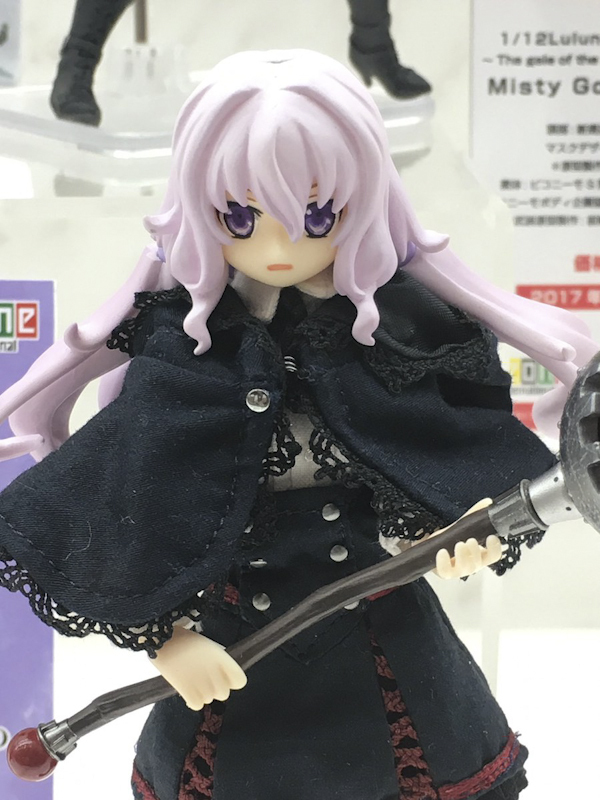 I just really wish I live in japan so getting event and limited dolls won’t be a problem. 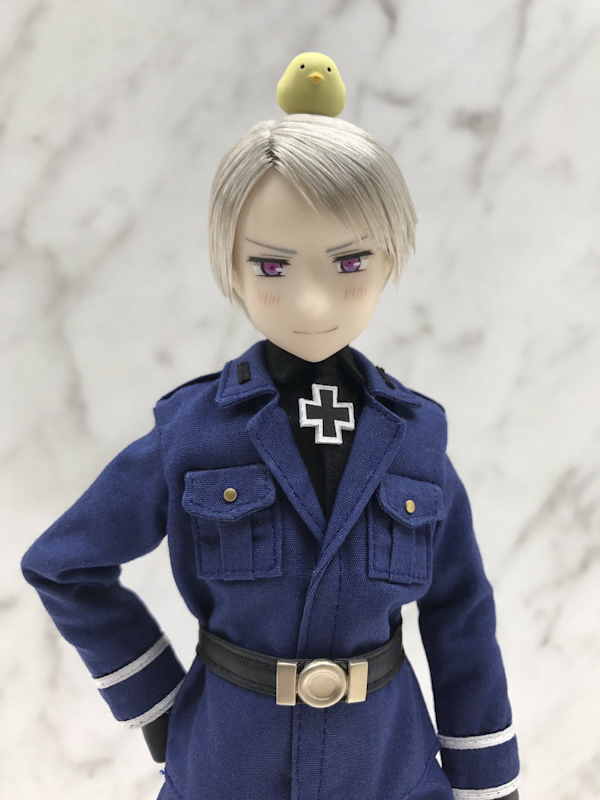 Now my choice is to look for another proxy as early as now or else I might end up on yahoo japan auction which is my least choice. Hi. You can try to use a Proxy site, for example White Rabbit. 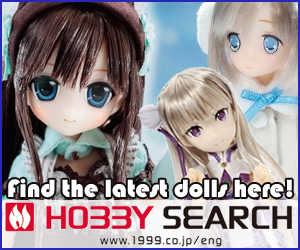 We used FromJapan and White Rabbit proxy shopping service to order our exclusive dolls. Both are great shopping services. 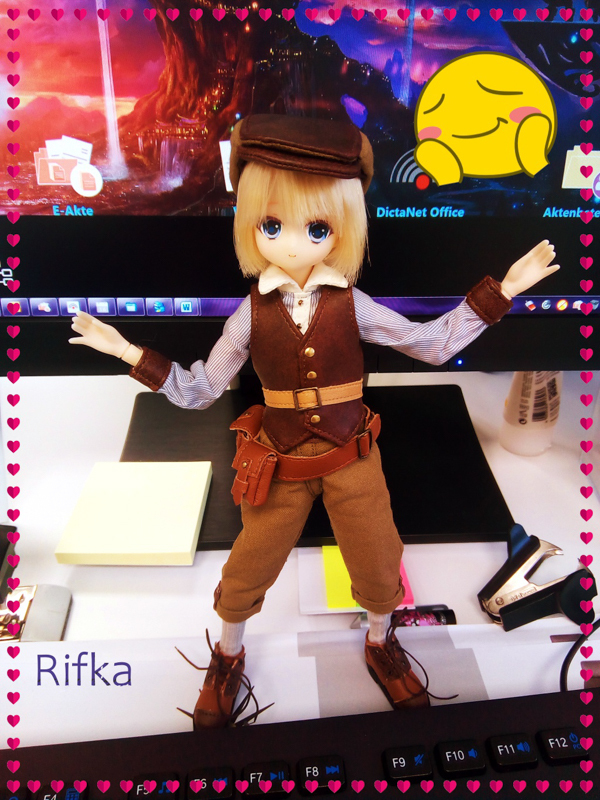 At this time there isn’t much information about KIKIPOP! Pink Cream Soda. But we’re keeping watch for any updates from Azone. 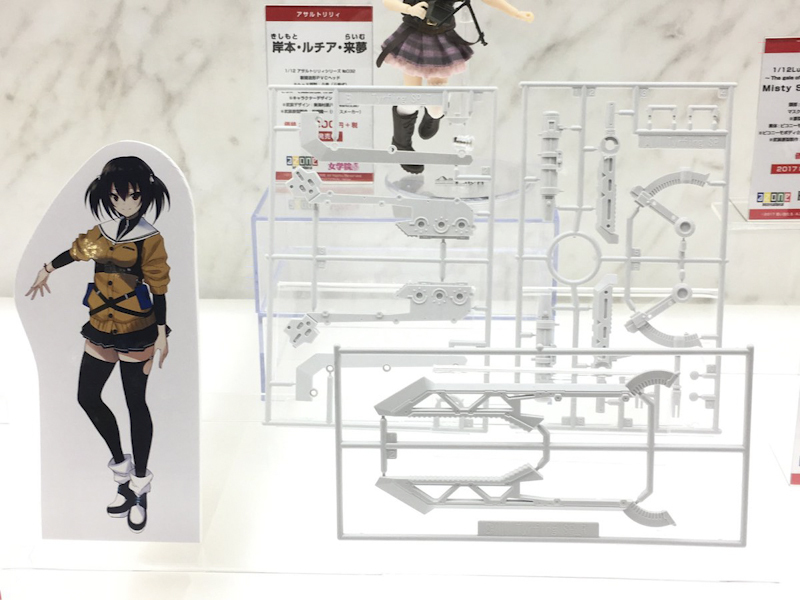 If she’s available online, there’s a chance that the 2 North America shops will offer her. 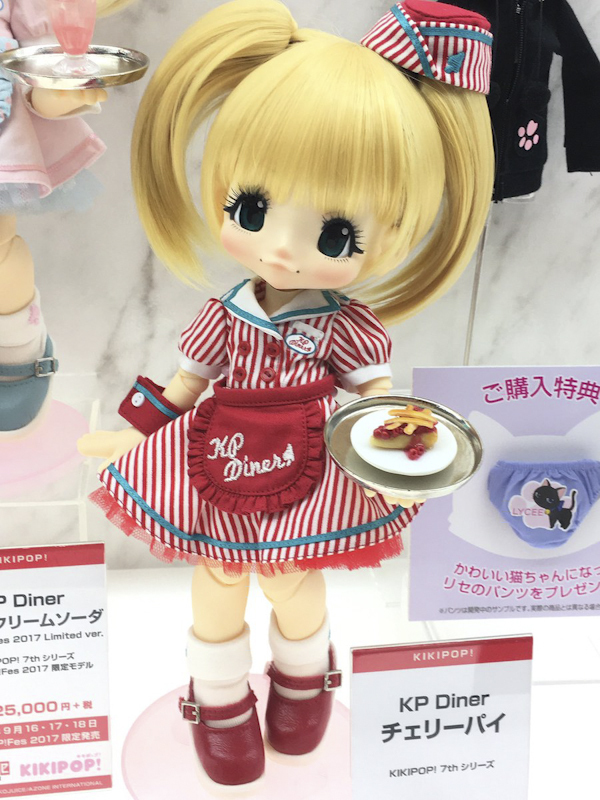 Does that mean there’s a newer picco neemo body than the one that came out not so long ago? 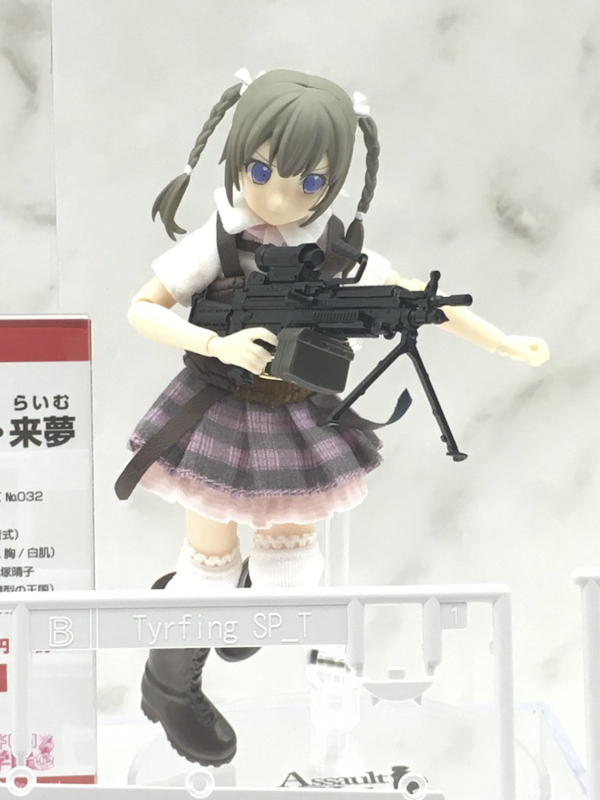 I’m still not sure I’m completely sold on the new pureneemo body but I will probably get one to try out. 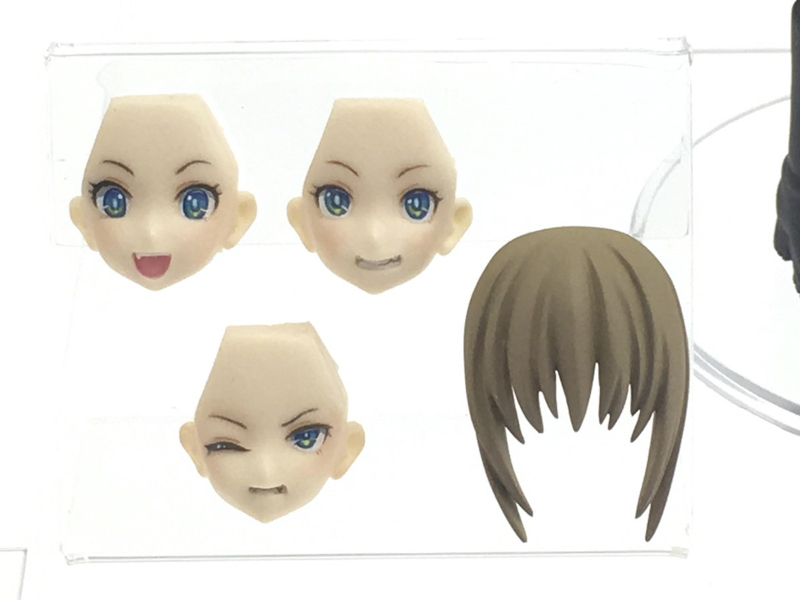 And those new boy sculpts … are they pureneemo too? The one with the grey heads. Because if they are … I’m going to be tempted. 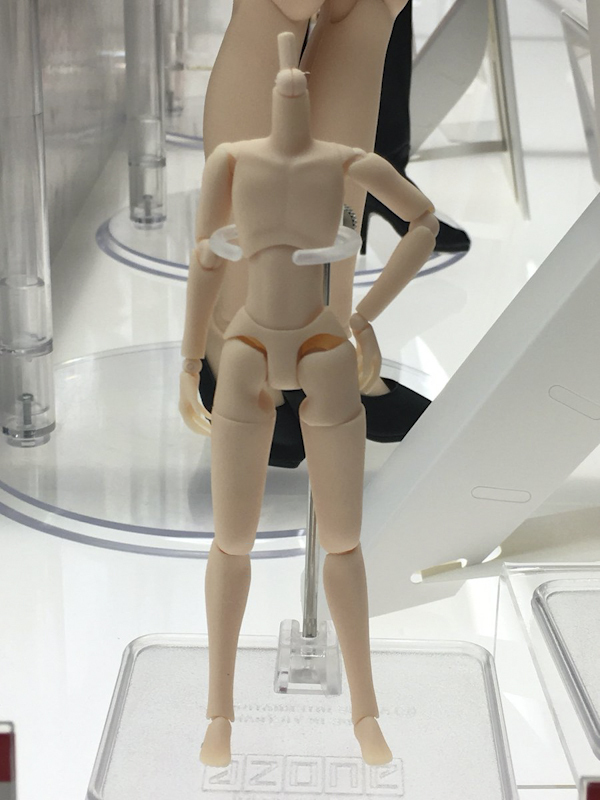 I think my main concern with the new body is how loose those pegs will be. 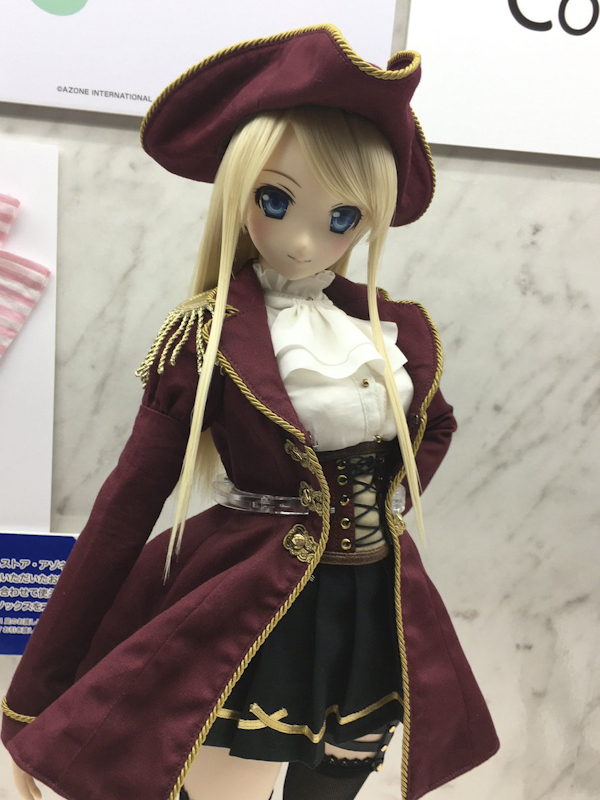 I hope they don’t fall out easily like the current picco neemo torso does. 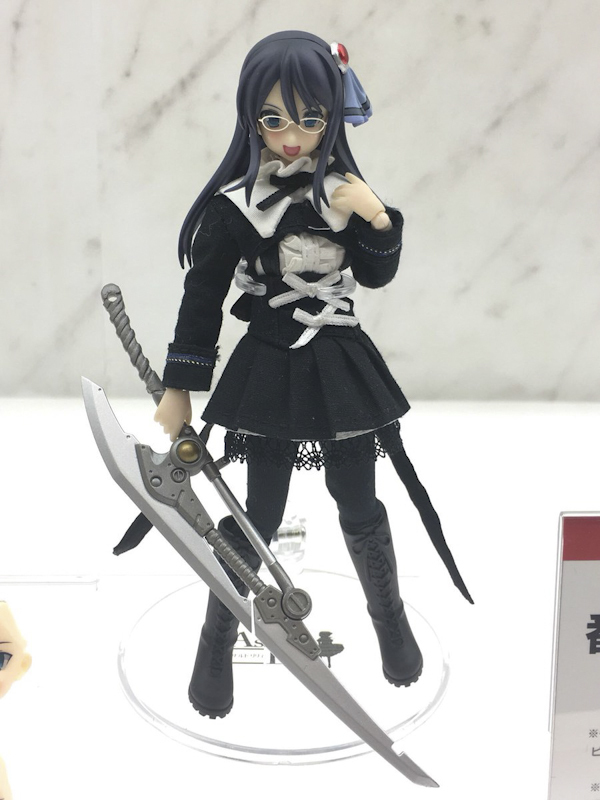 Otherwise, I must admit, posing looks pretty good. 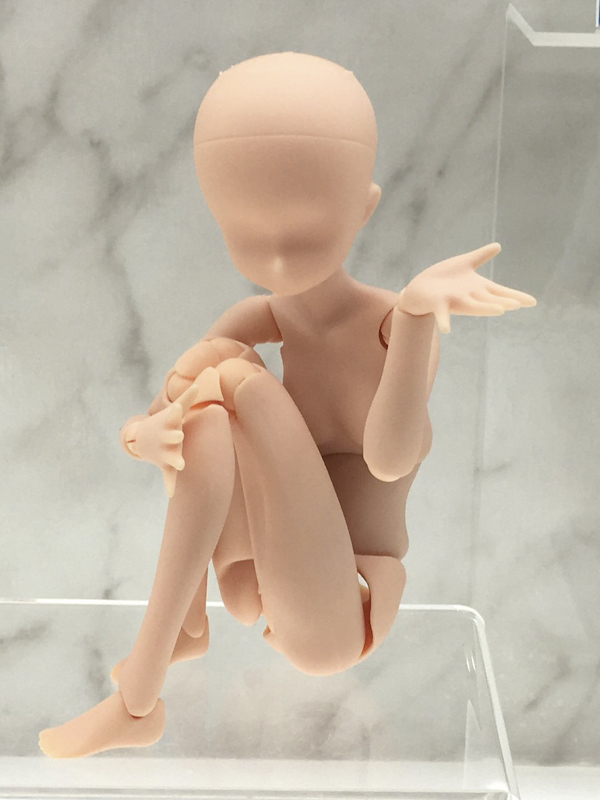 Don’t get me wrong, the new picco neemo body (the one I have currently) does some pretty stellar poses. 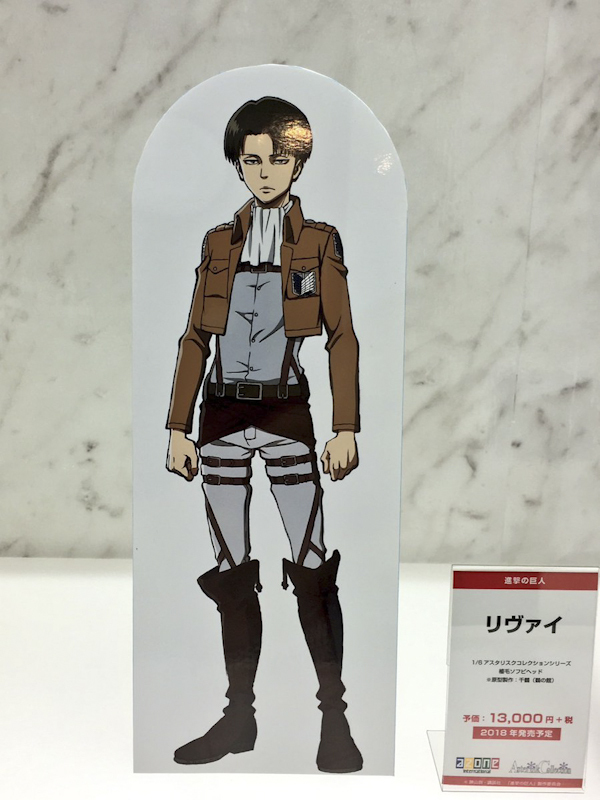 If that torso would just be a bit more secure, the body would be pretty much perfect. 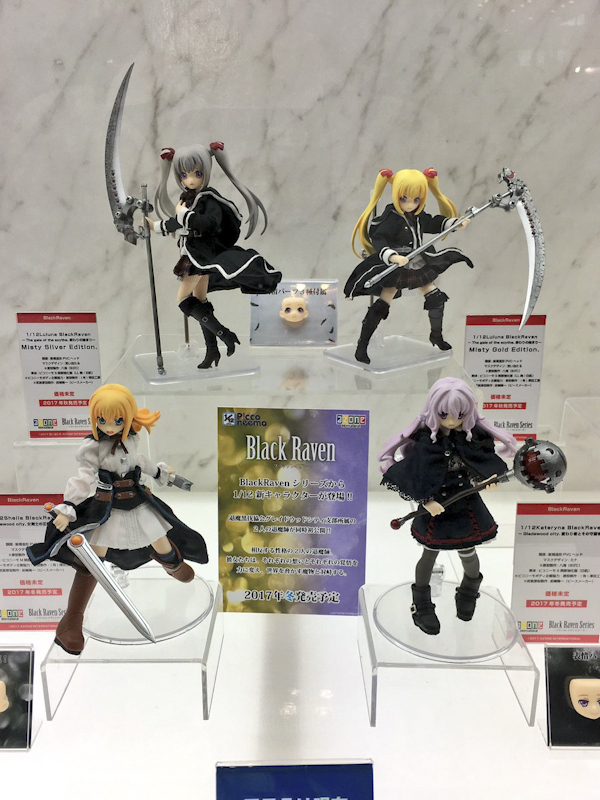 There are some pretty great looking releases coming out though. I’m happy to just look from a distance with those. I have way less space in the cabinets these days that I have to be a lot pickier about what comes home. 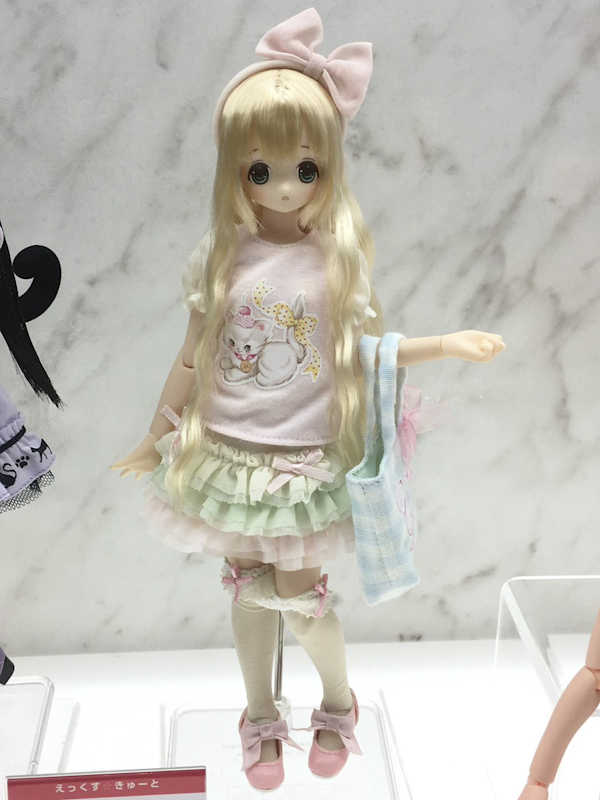 On a side note, I ended up getting that Pastel Momoko girl that I didn’t like initially! 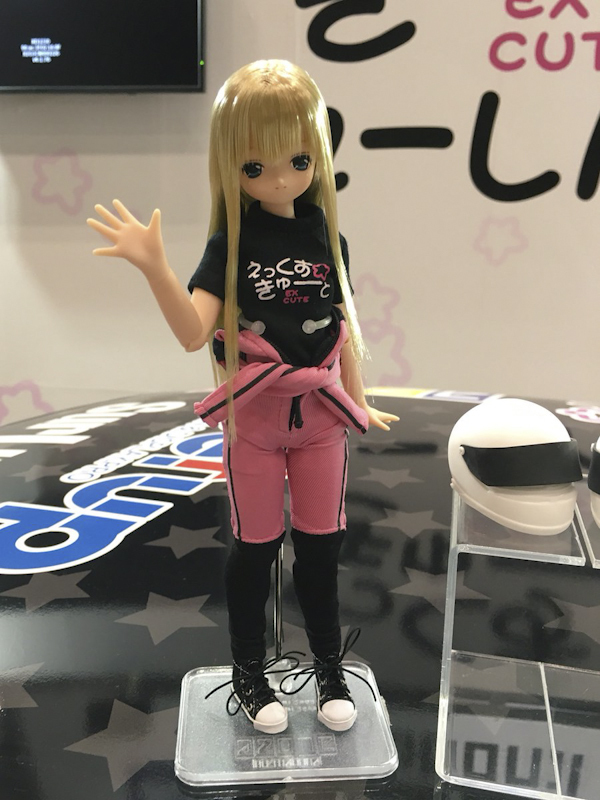 If you have Picconeemo Himeno (2016) or Raili (2016) then you have the latest Picconeemo body. 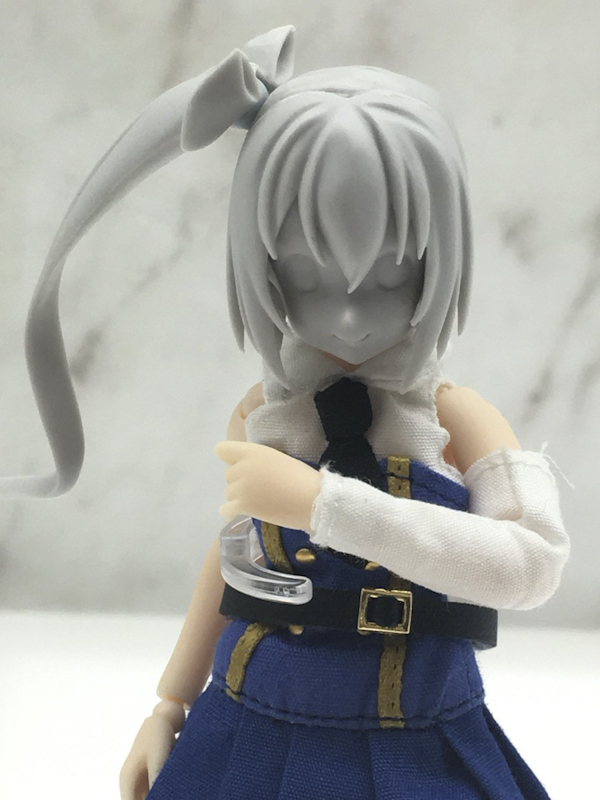 Playing with our Picco neemo is fun but it doesn’t last long because as you said her torso & her feet keep popping off. 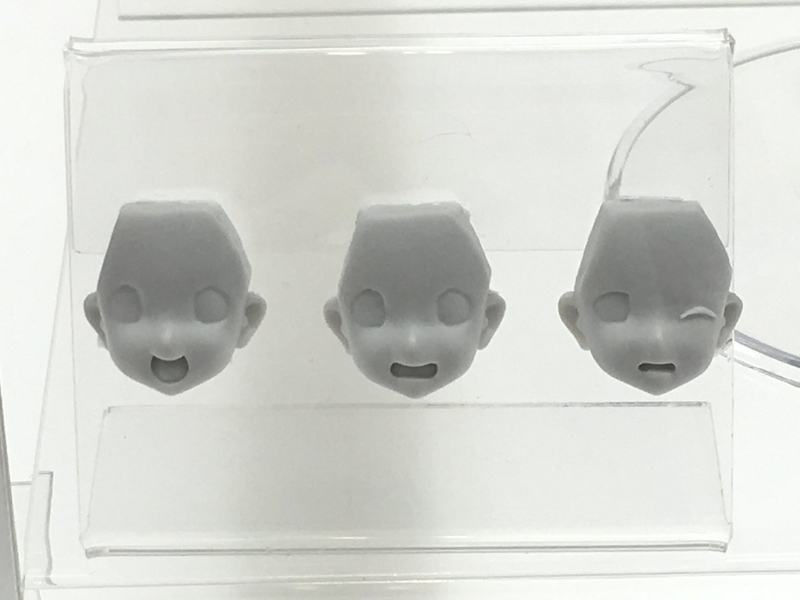 I too hope they improve this issue with the picco neemo boys’ body. 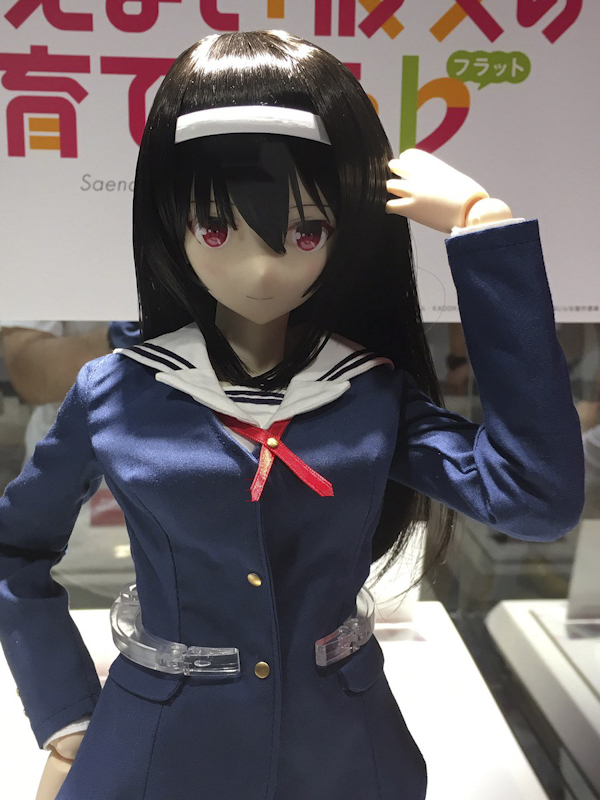 Azone presented fans with a lot of promising dolls. 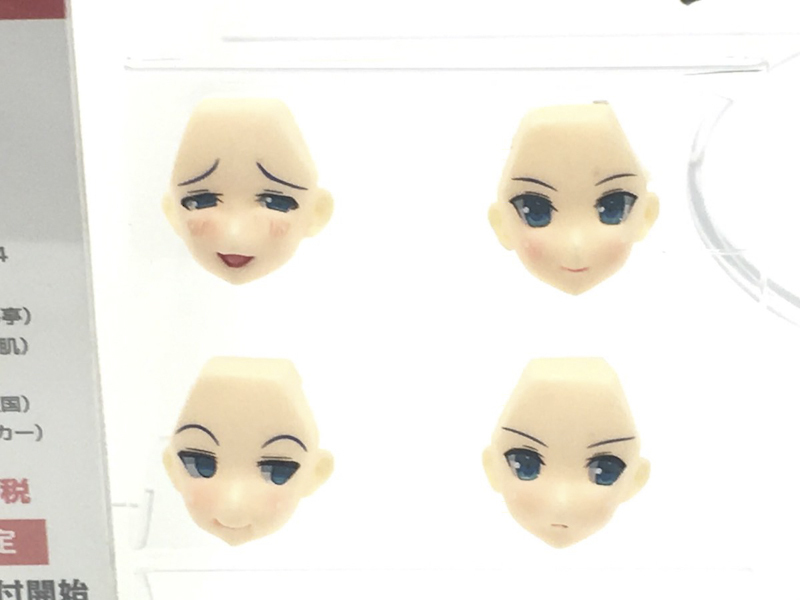 Now we’ll have to sit back and see how well they’ll execute these prototype dolls. 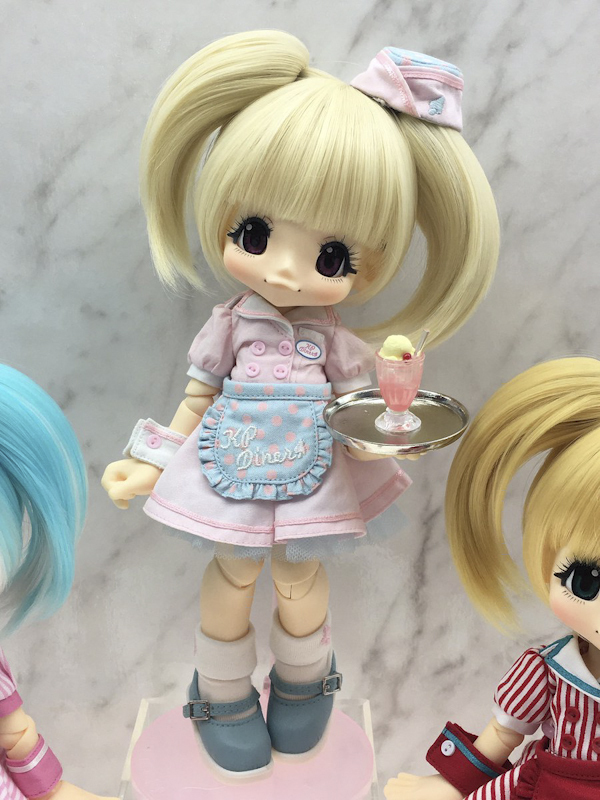 Oh, how is Pastel Momoko? 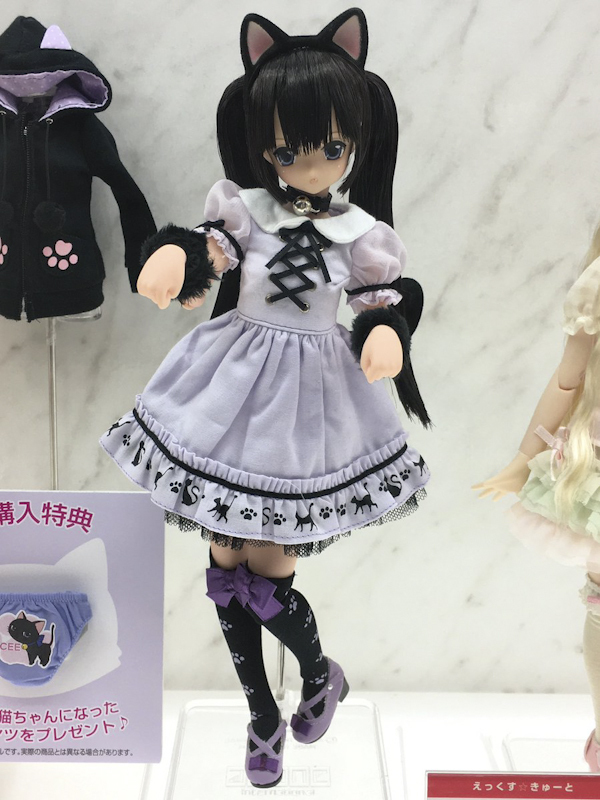 Thank you sharing your thoughts about Azone International’s Wonder Festival 2017 Summer dolly display. 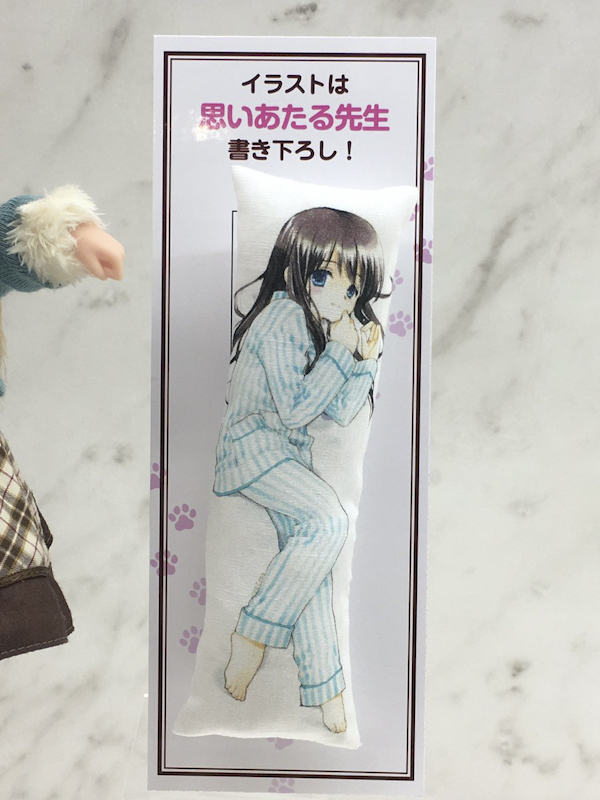 I do have the Picconeemo HImeno. She’s a sweet little poser when all is said and done I have to admit. 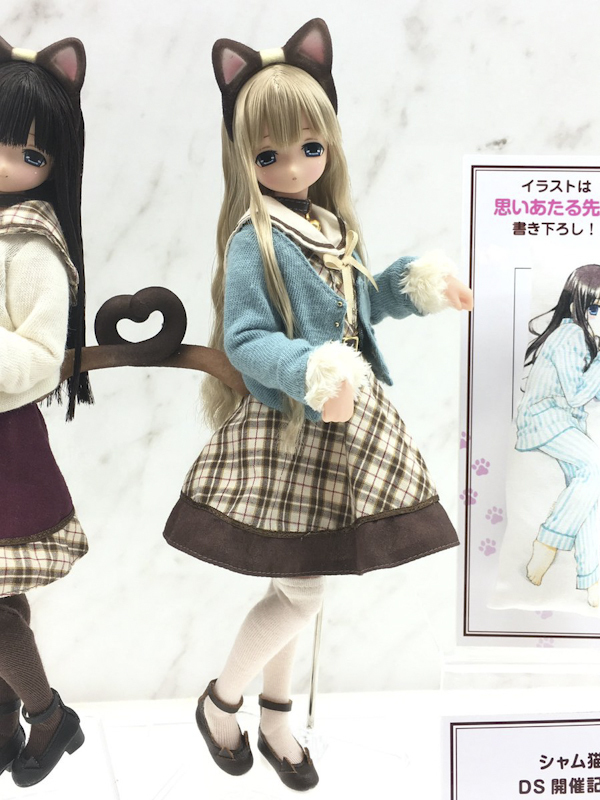 Will you review the new Pureneemo body if you have those on hand? 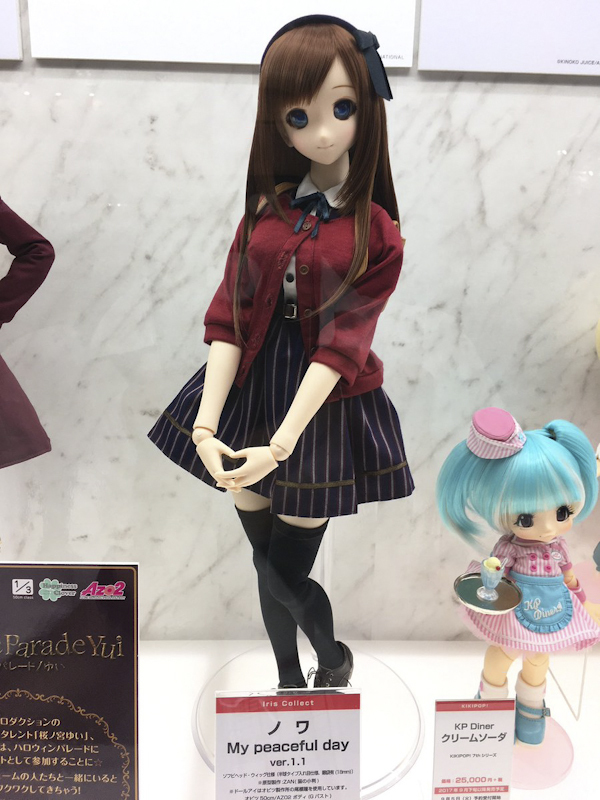 Pastel Edge Momoko is a lot prettier in person I feel. I don’t think the promo photos do her justice at all and her outfit is so beautiful and elegant. I’m really loving her, a lot more than I thought I would. 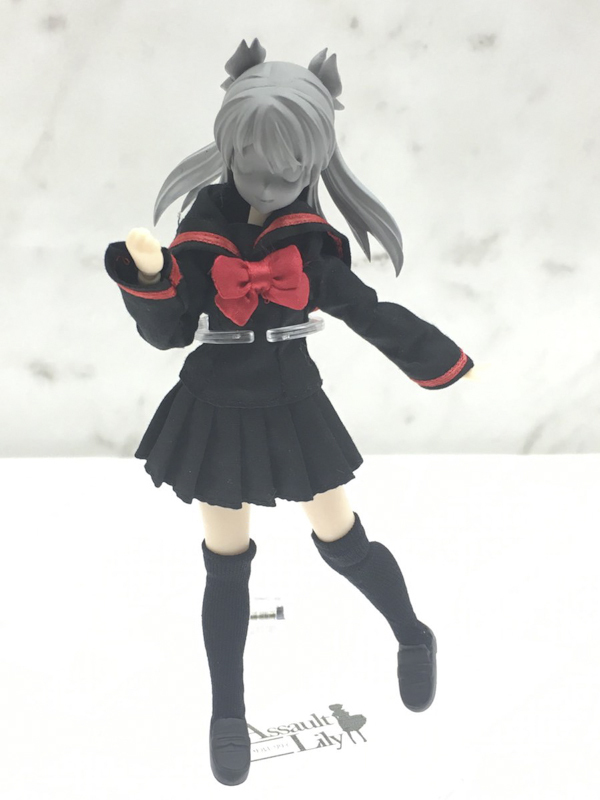 It’s a shame the promo pics didn’t do her justice. They’re the first contact we have with a doll and a lot of our decision are based off of those promo pics. But I’m happy to hear you like her. Hopefully, others will fall in love with her too. Oh, we hadn’t thought about doing a body review. It’s certainly something we’ll consider especially with out these new body types coming our way. 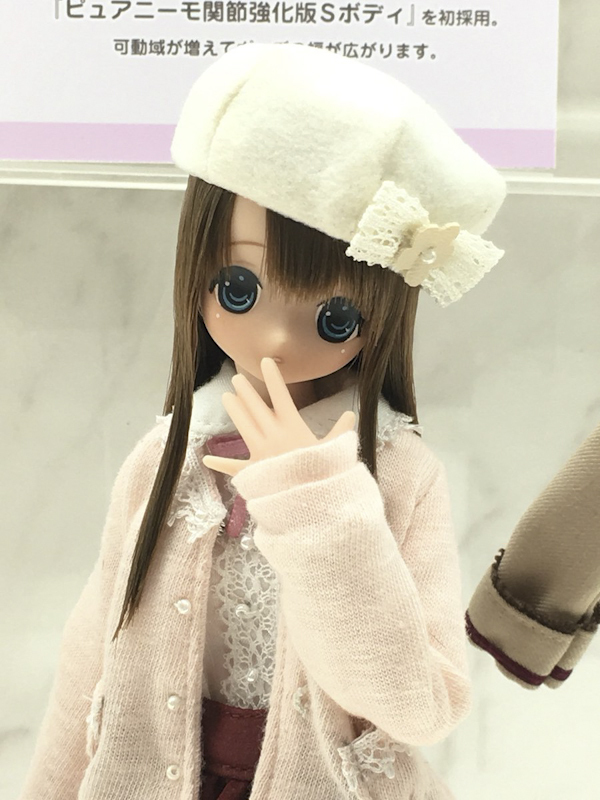 Thank you for coming back and updating us about Momoko Pastel Edge. 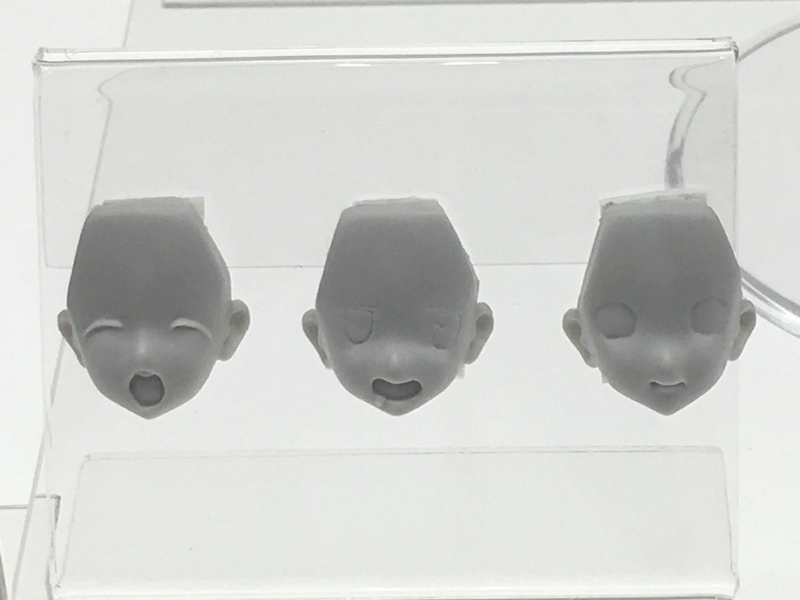 Currently mostly interested in the two Picco Neemo boys with unpainted faces. And the Li’l Fairies. 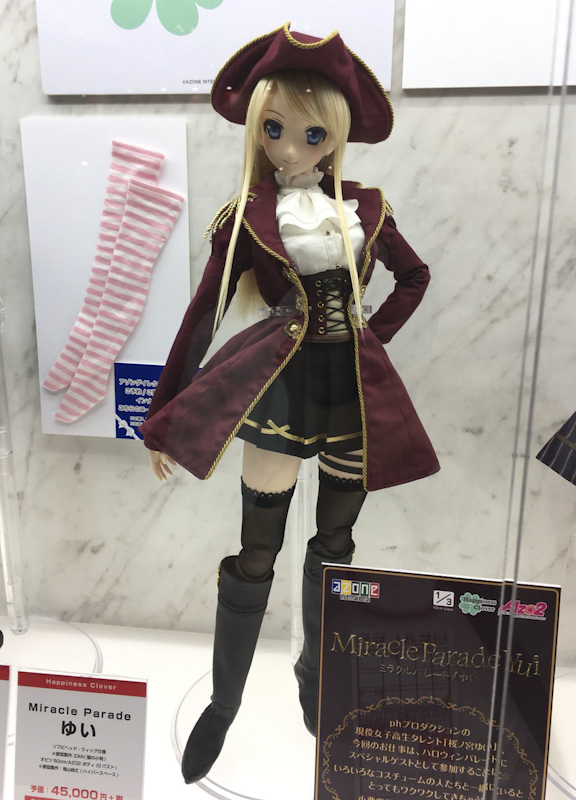 And the Iris Collect one, and Miracle Parade Yui. 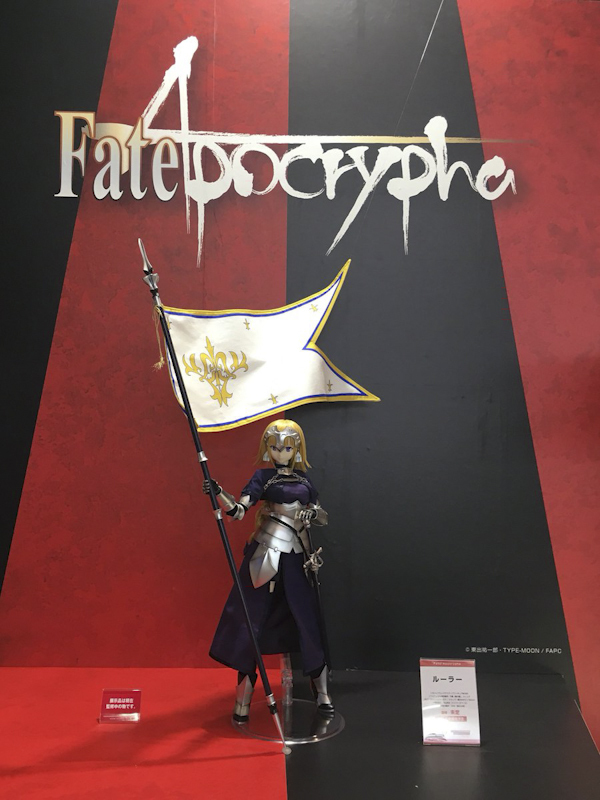 And… there goes all my money! I’m thinking of things I can sell on eBay or dusting off the old resume and getting another job or something. 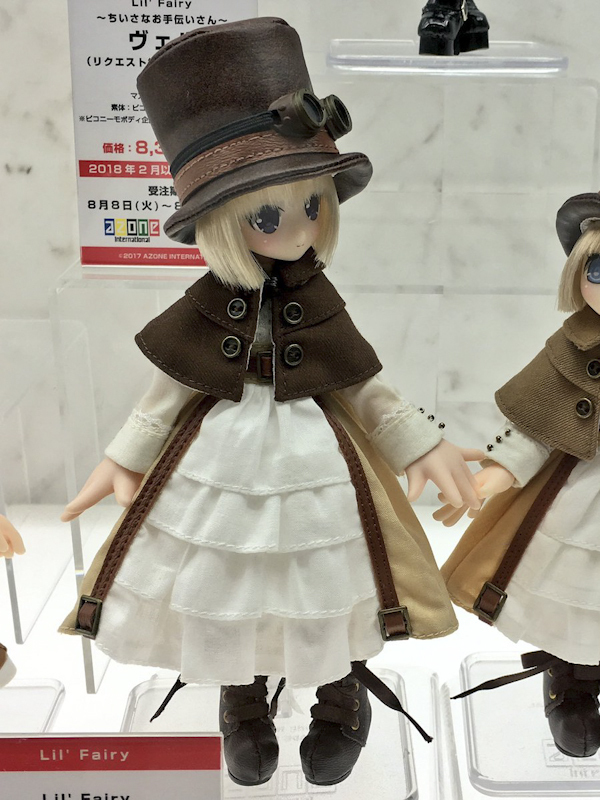 There’s too many adorable dolls coming our way that it’ll be difficult to pass them up. 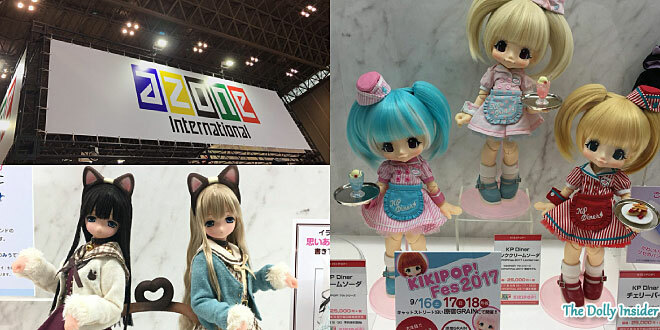 Thanks for sharing your faves of Azone International’s Wonder Festival 2017 Summer dolls. Hehe ShortNCuddlyAm, do I hear you. Lucky you though, at least you still have some organs to give. One of our goals was to have a friendly place where fans could express themselves with others who share their interest. We’re glad you’re enjoying it. Hi. 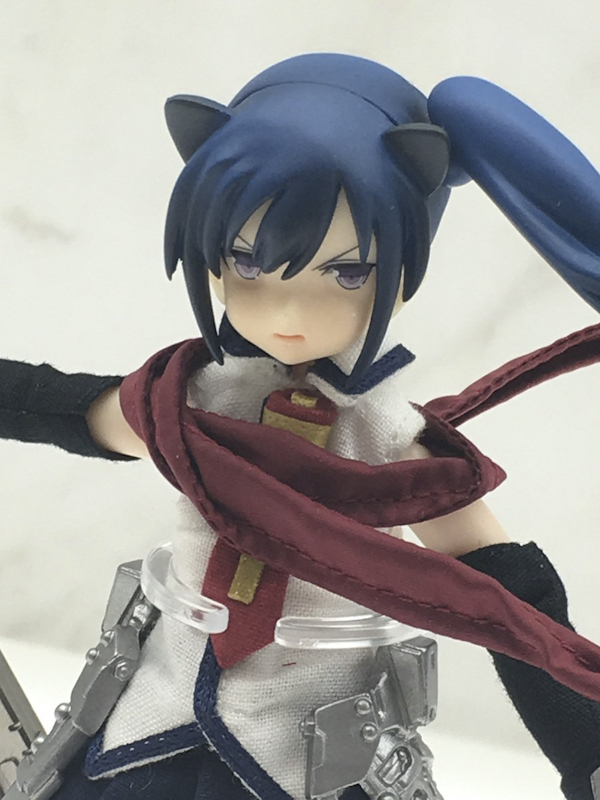 Does Azone rerelease only Riam, Vel and Erunoe or they rerelease Lipu and Nelly too? They have old or new body? 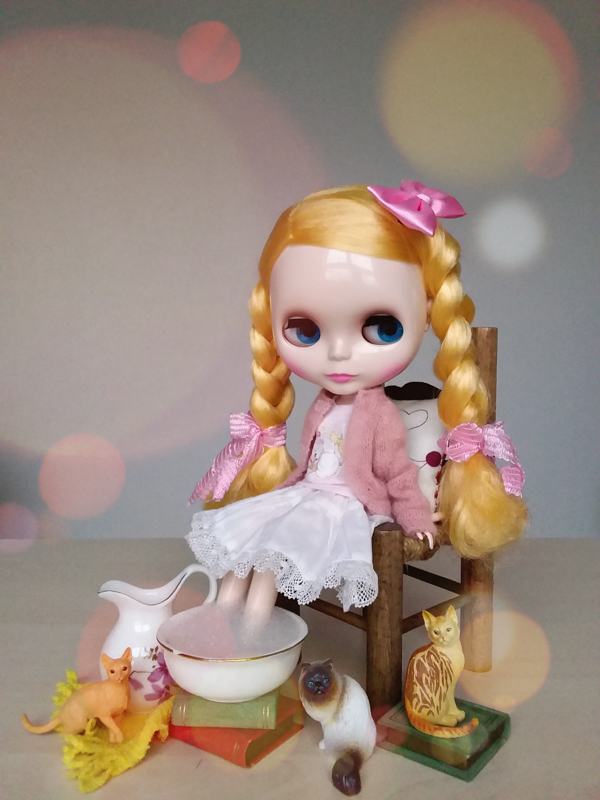 I love new little Fairy: they are too cute! 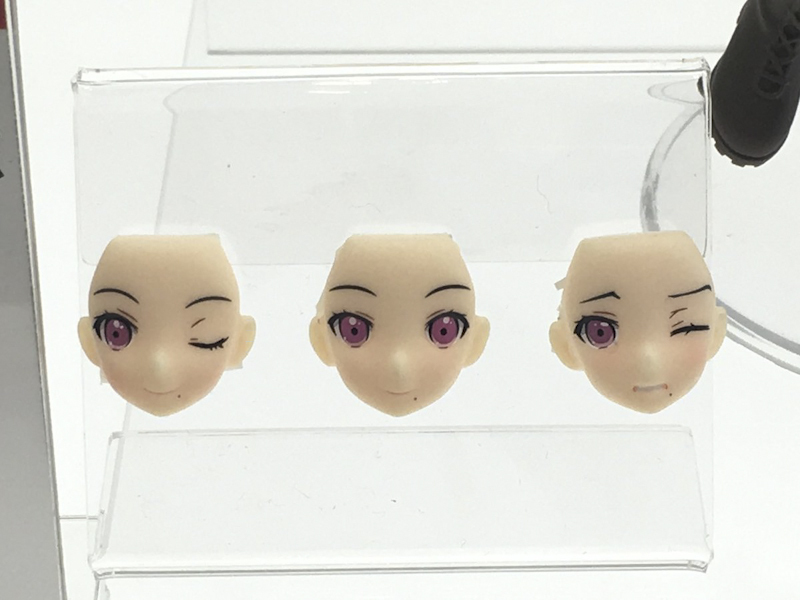 It doesn’t look like the 3 girls will have the new body. 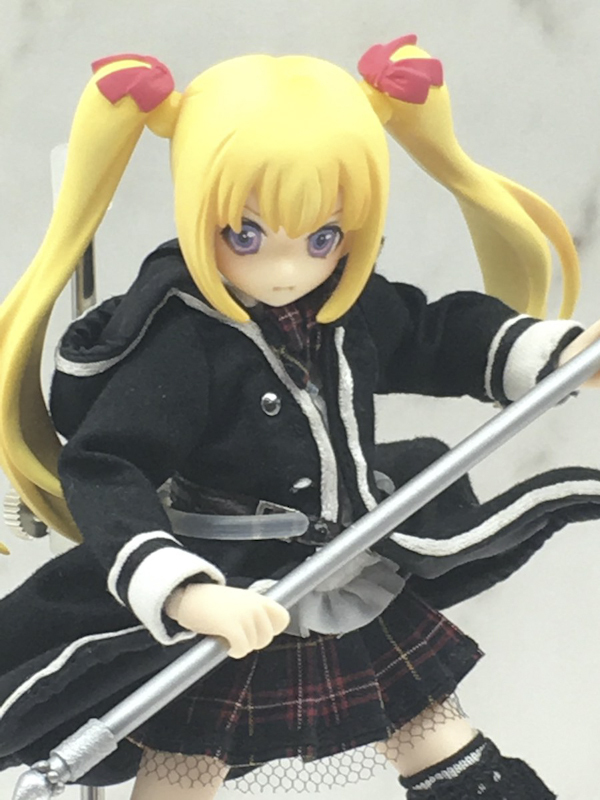 I’m not sure if Azone re-released Neilly or Lipu in the past. 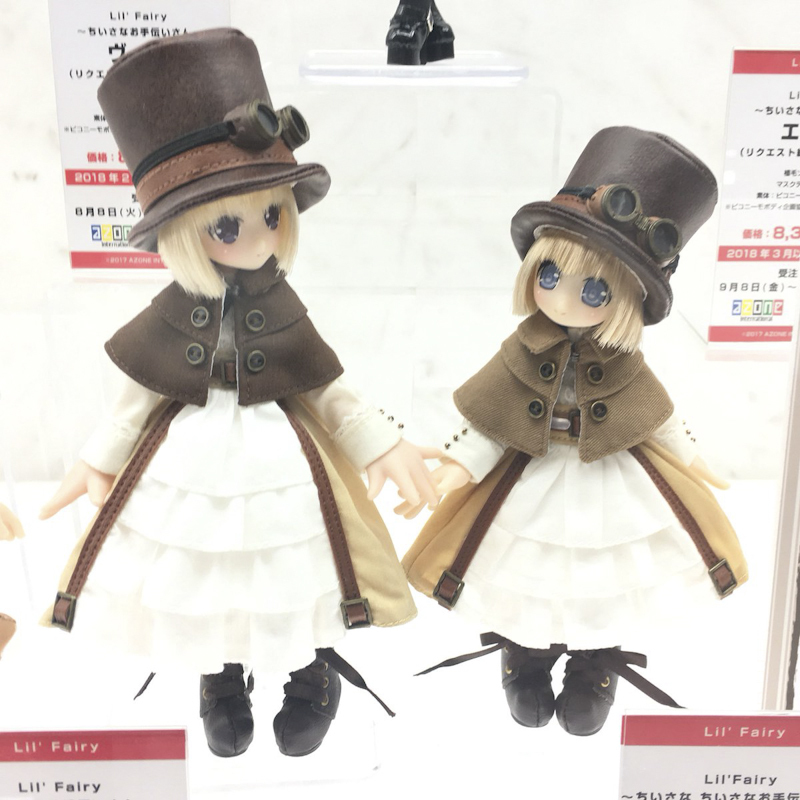 Which Neilly and Lipu are you referring to? Do you happen to remember where you may have seen this news? We may have missed it. 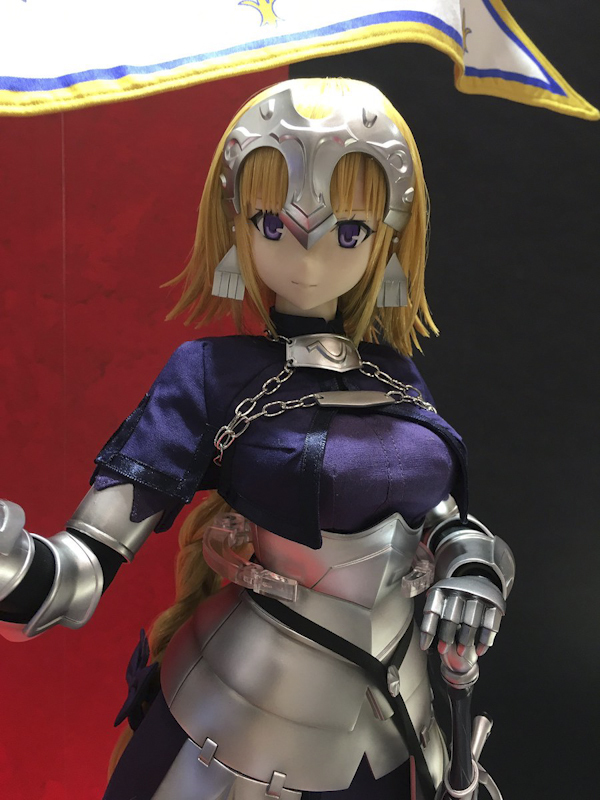 Thanks for taking the time to leave a comment on Wonder Festival 2017 Summer: Azone International. 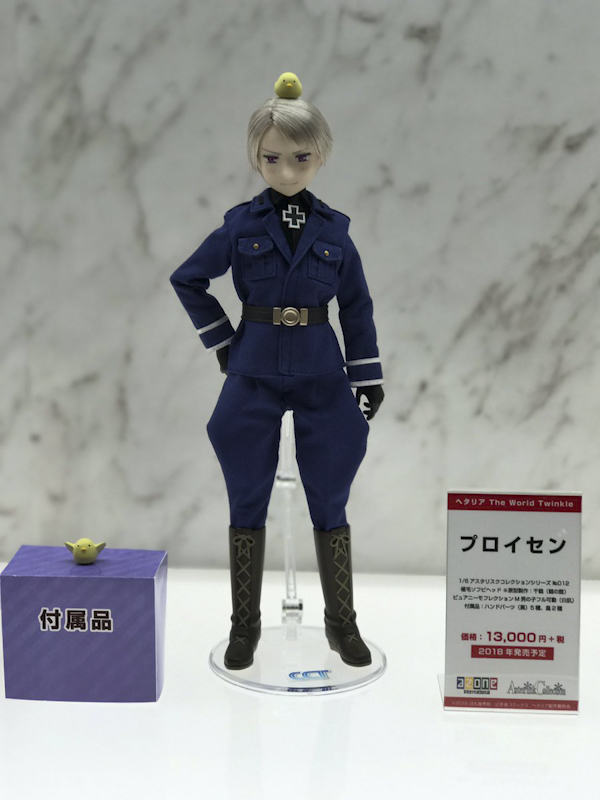 That Pico Neemo (1/12 scale) boy body..ughh. That’s not how man body looks; the lower torso is very feminine, the pelvis is round and wide and the stomach is too lean. 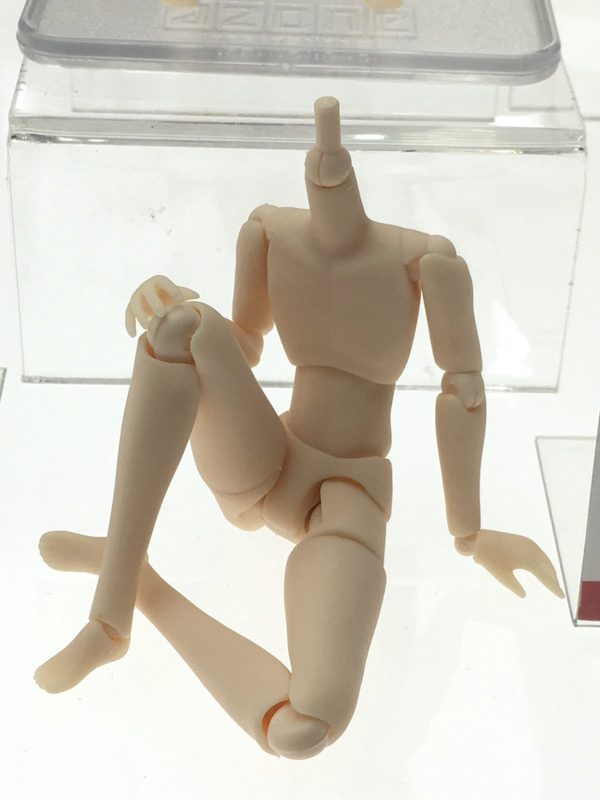 Another thing is that usually more pronounced with man legs is that they get thicker after the pelvis area which this doll body also lacks. 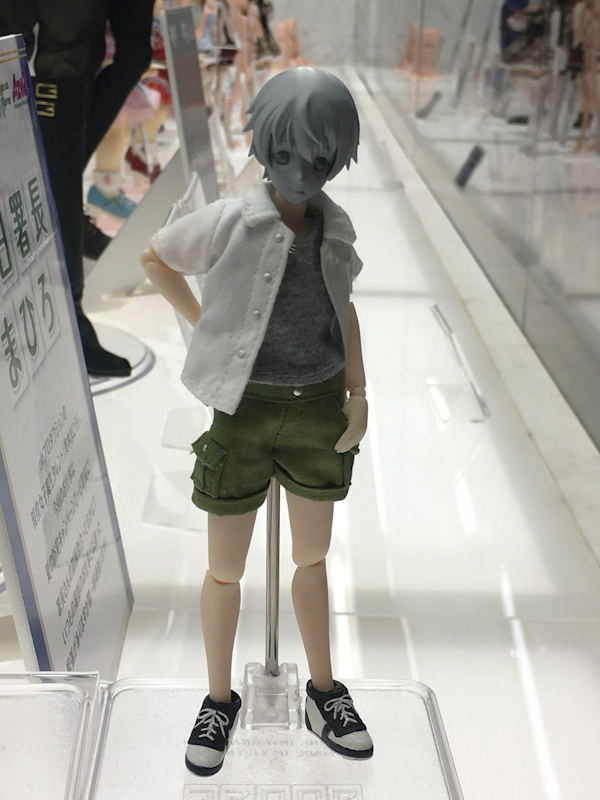 Basically, this is just a lzay remold of the female body-_-…I hope Azone do a better job with the male body for Pure Neemo(1/6 scale); make it a complete new mold and give it a manlier look. 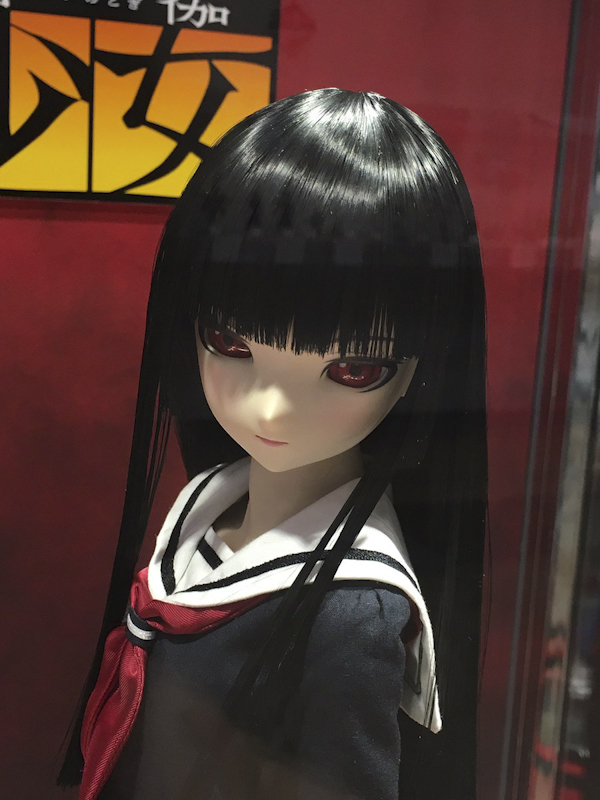 The 1/3 scale Jigoku Shoujo is gorgeous*-*, but I’m not ready for this size of dolls nor this amount of spending money over a toy. I like the racer outift, I wish they were actually selling it. 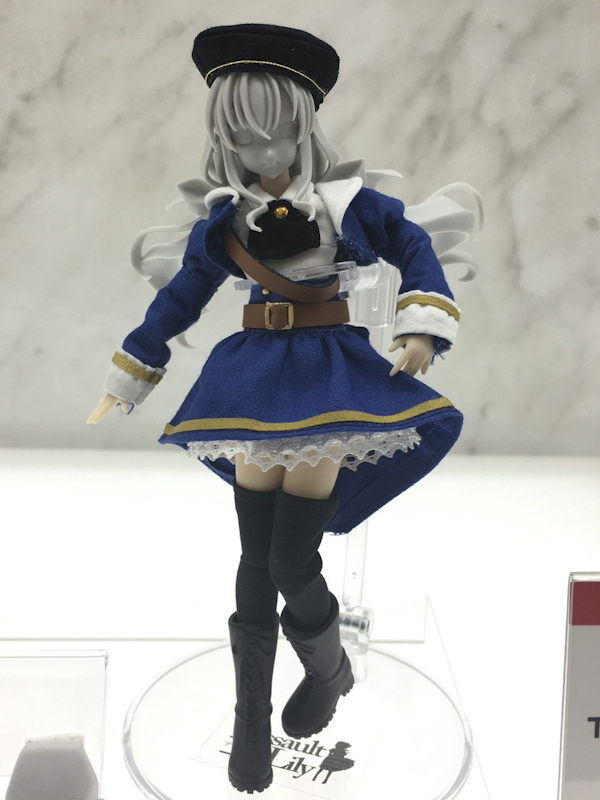 One of the good things about Azone is that they continue to improve/tweak their designs & doll bodies. 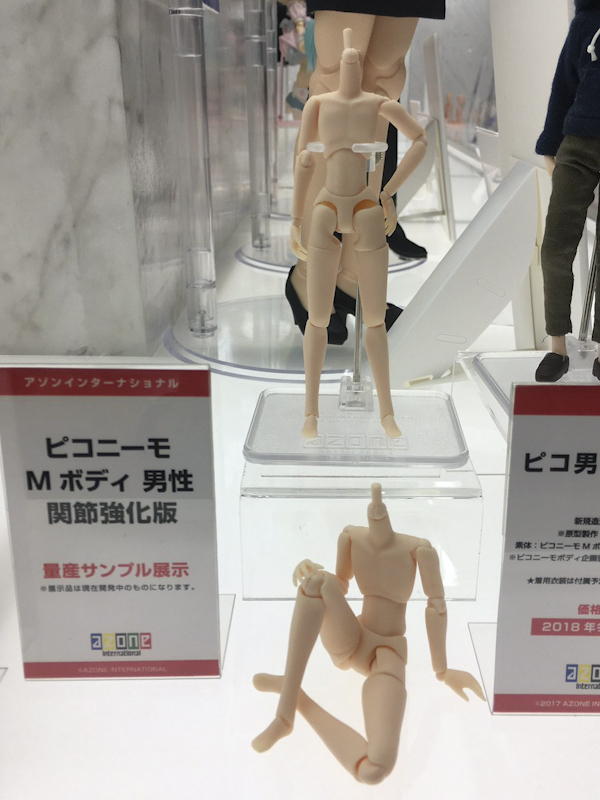 I’m sure they’ll continue to make improvements on their male picco neemo bodies as well. 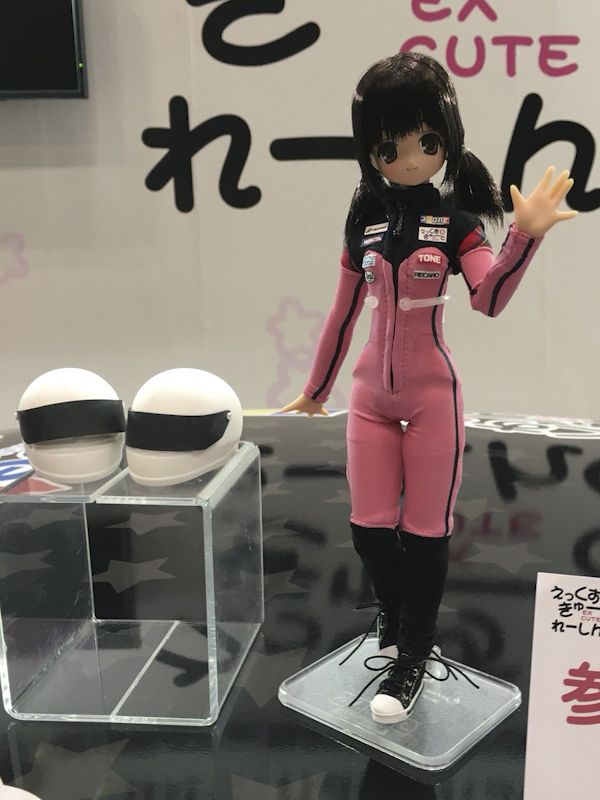 Yes, the racer girls in that outfit are cute. They seem a bit curvier then usual must be the silhoute of the outfit. 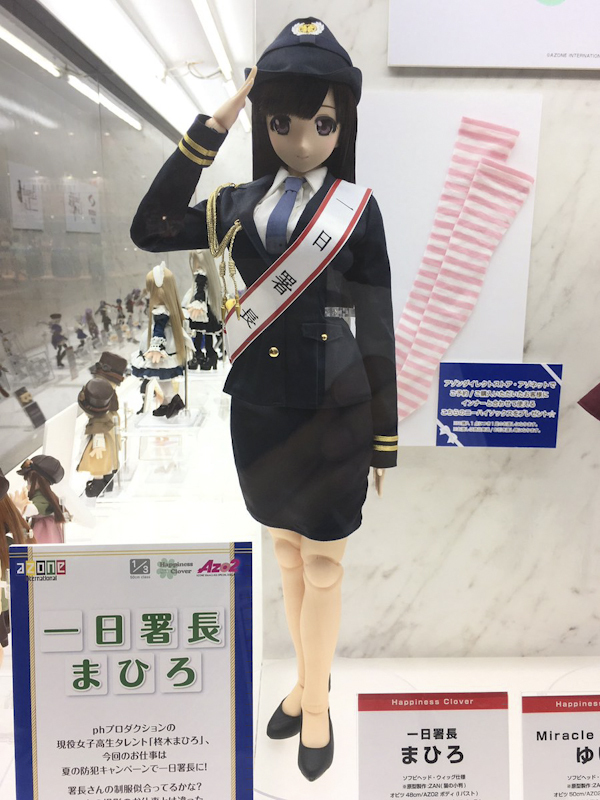 Thanks for sharing your thoughts about Azone International’s Wonder Festival 2017 Summer doll display. 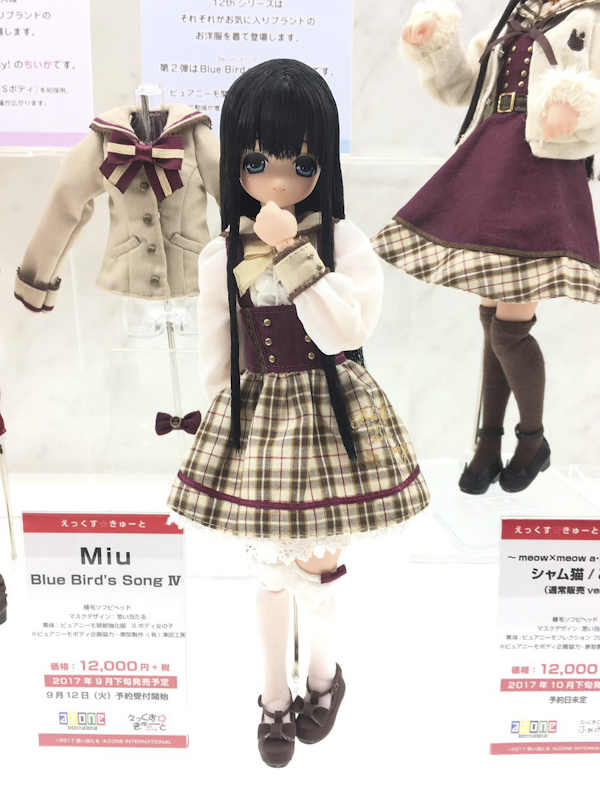 I’m kinda disappointed with the new 12th EX-Cute series; I hoped I will find doll that I would really like, also I’m not a fan of the inconsistent quailty of the line which by that I mean some dolls get simpler outfits for the same price tag. 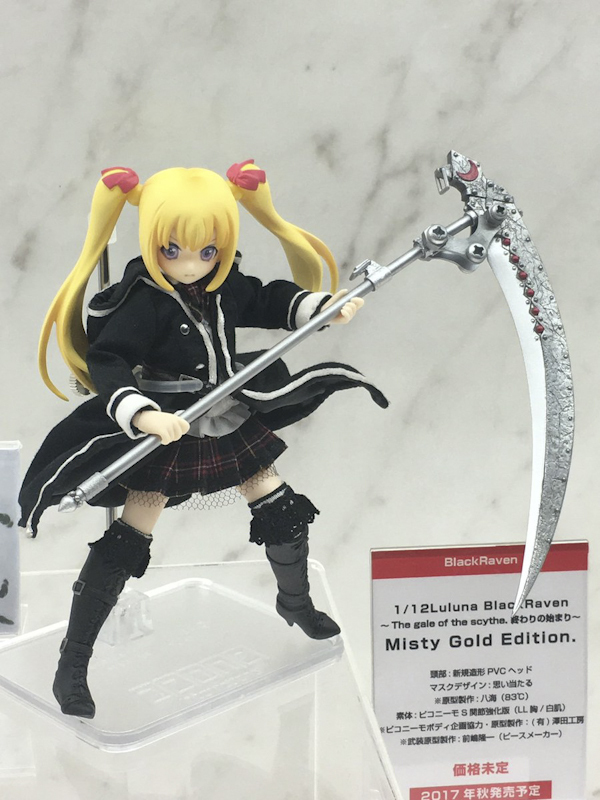 I think I will end up buying Lien, I am quite fond of her despite her simplstic outfit and blond hair. 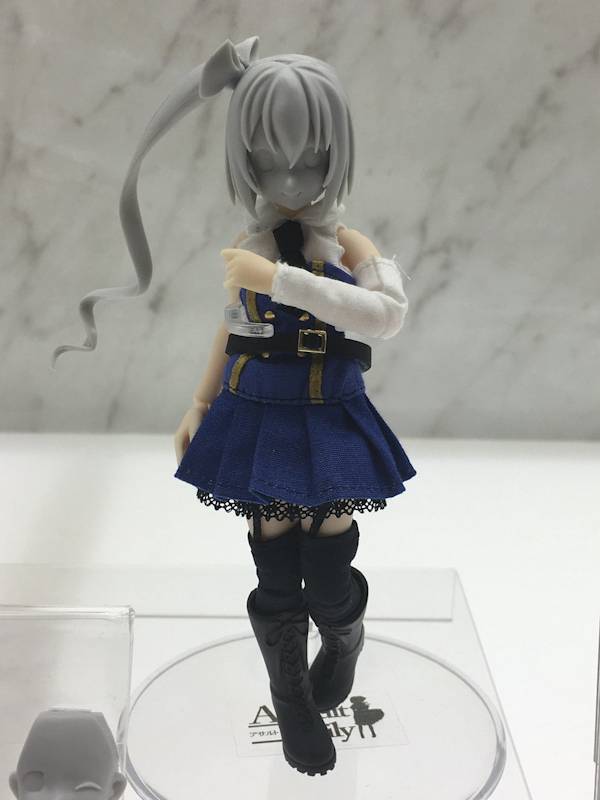 I like how she has more gentle and may I say “reserved” cuteness and not too much like most Azone dolls. I also like how her outfit reminds me a bit of the 90’s, toys that gives you nostalgic feeling is always a plus in my book. 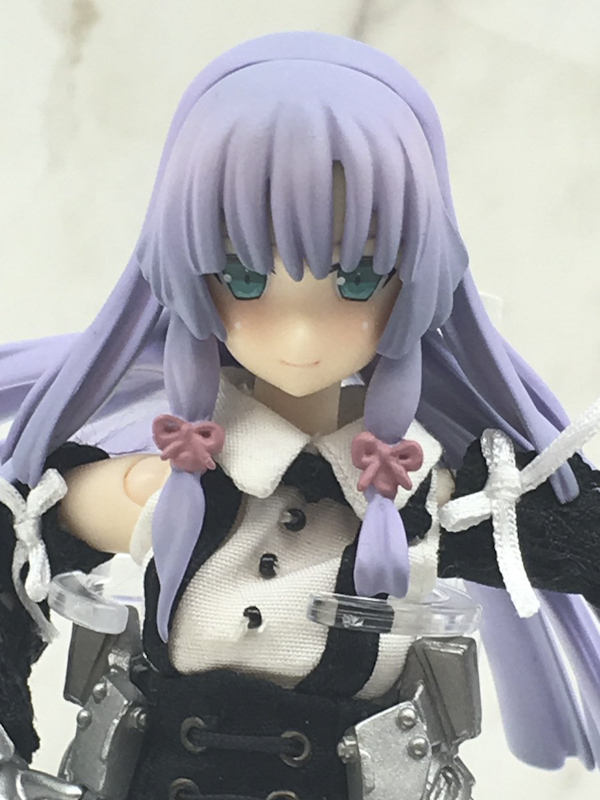 So I think I give her a try even though I she isn’t prefect in my taste, I just really want one of those new Azone dolls with the highly articulated body for my upcoming birthday and I am not sure if I will see any better releases in the near future. I probably buy some few clothes separately. 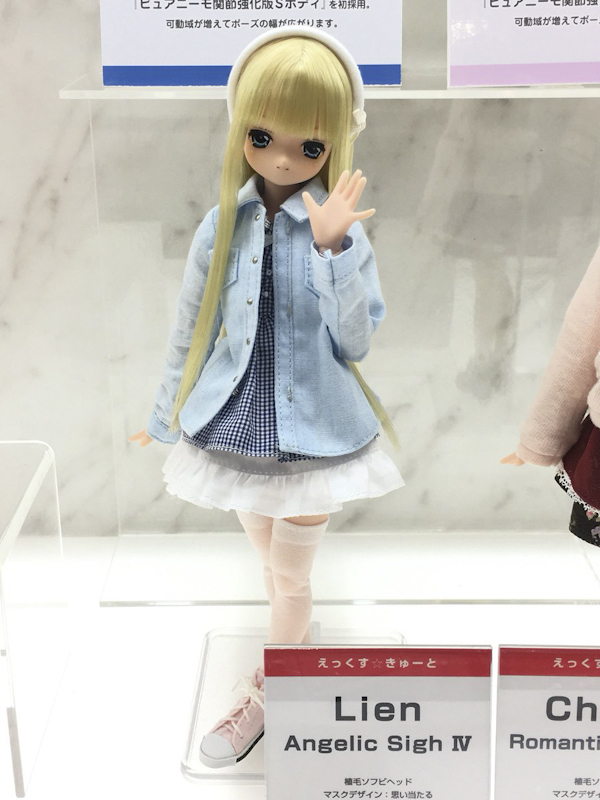 I wonder if they eventually update the Sahara’s a la mode body…maybe they want to profit from selling the imporved bodies separately which is a shame, since I like their faces more then Pure Neemo:(. 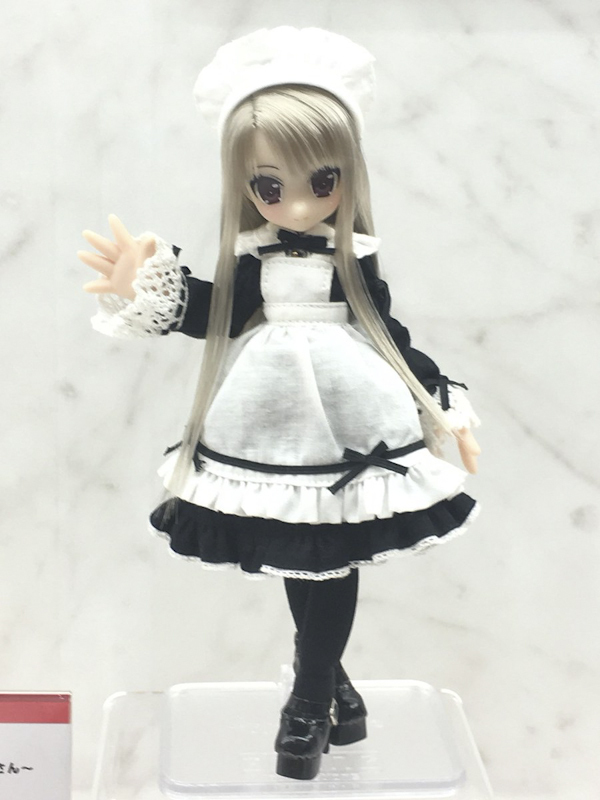 Is it common for Azone dolls? 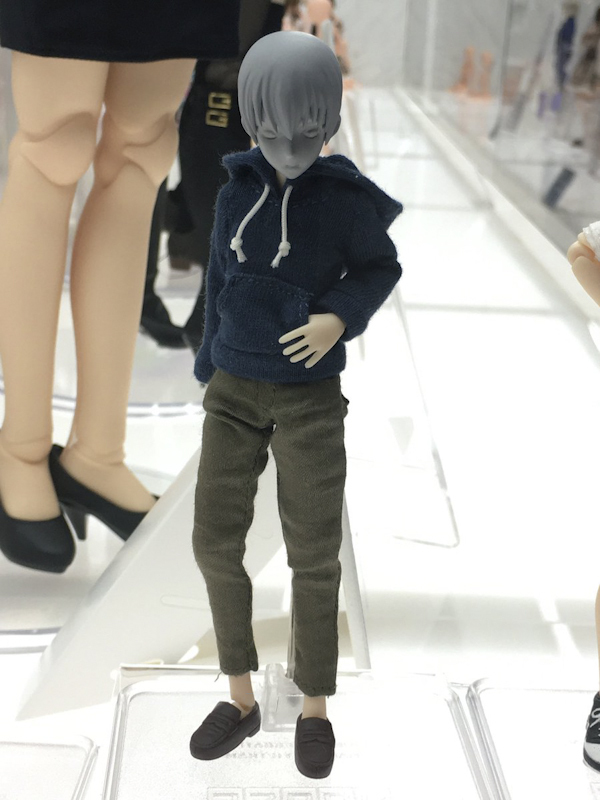 I don’t want to spend 100$ for a fashion doll which have thin hair rooting:(…. 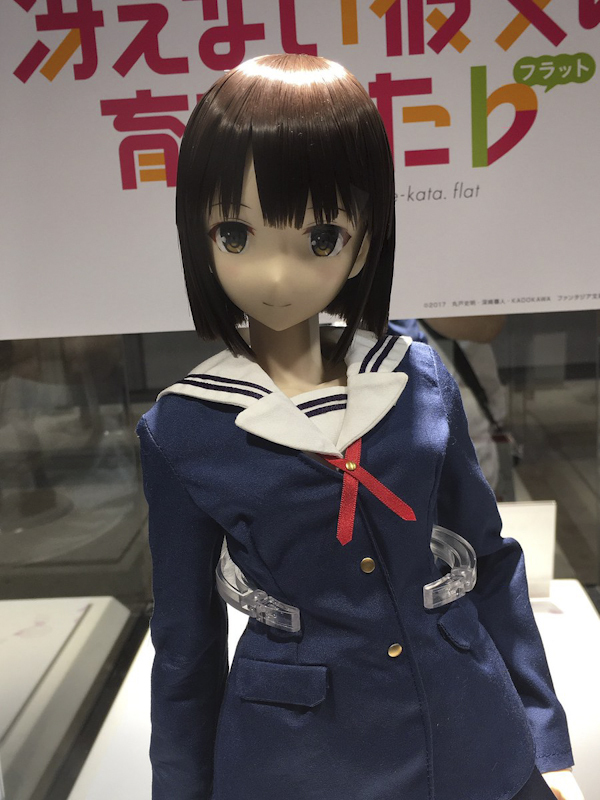 Just checked some of mine – a relatively new one and a couple of older ones (Makota from Flying Witch and a couple of Sahra’s A La Modes). They don’t seem to be thinly rooted. 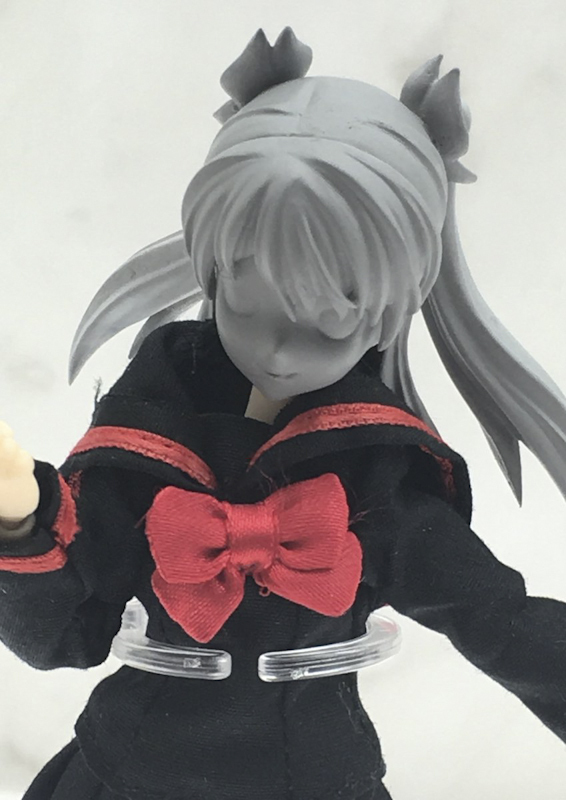 I mean, you can see the holes, just about, if you pull the hair to the sides enough – so you would see some “skin” if you had the hair pulled hard into side bunches. The head is also painted behind the hair to be a reasonable match. But I’m confused why you chose that pic as the review it’s from says the rooting is sufficiently dense – not that it’s thin. The review says the rooting is sufficiently dense, meaning there’s enough hair there, not that it’s too thin. That’s why I’m confused! Especially as the more I look at the pic the less it looks especially dense at all. 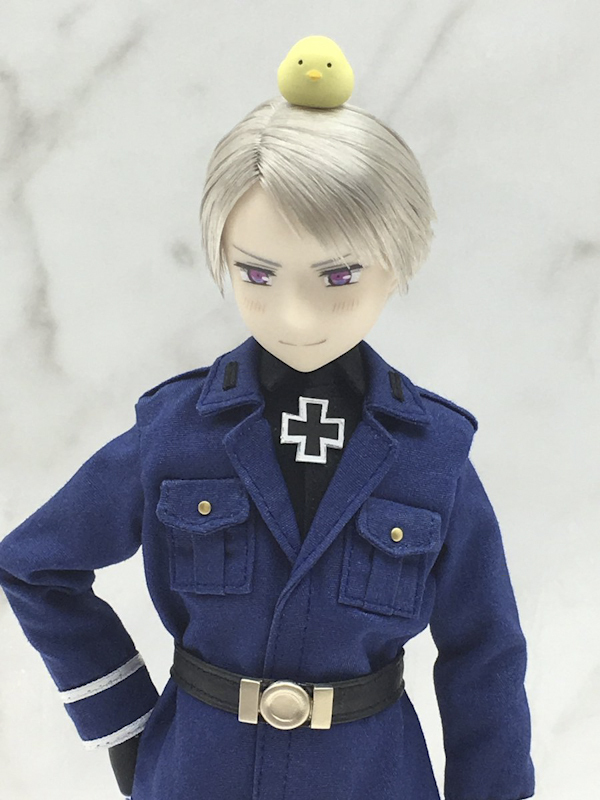 That said, the hair in that pic does look thinner the ones of mine I looked at earlier, so I’ve just done a bit more hair parting – the very few I have with blonde or white hair look thinner on the back than the ones with darker hair. I don’t know if that’s because the paint does a better job of disguising it or if it’s down to something like different fibres used in the different colours. I’ll try take a couple of comparison pics tomorrow so you can see what I mean. 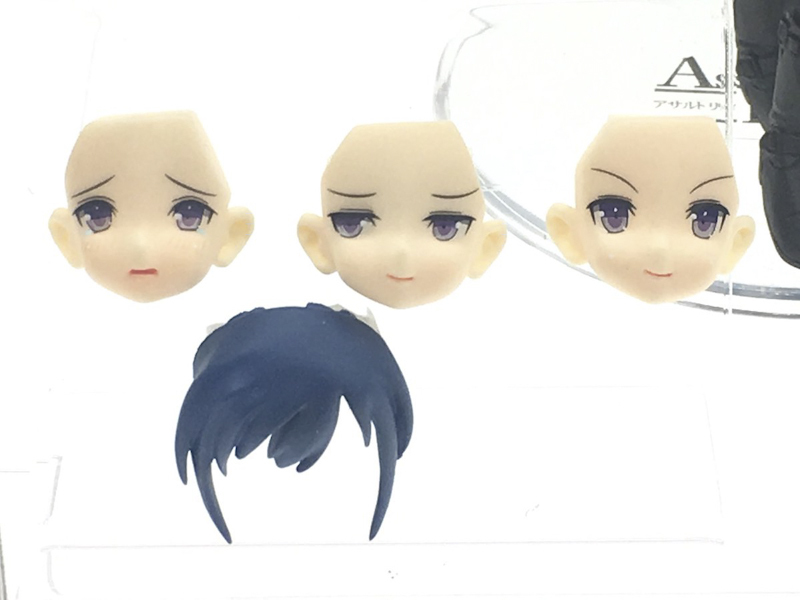 I don’t have any other rooted heads to compare them too, but compared to some of the wigs on my Obitsus the thinner hair looks a lot more natural. The downside being you’re more likely to see holes (or the wig cap) with certain styles. Thank you very much^^! The photos are great. 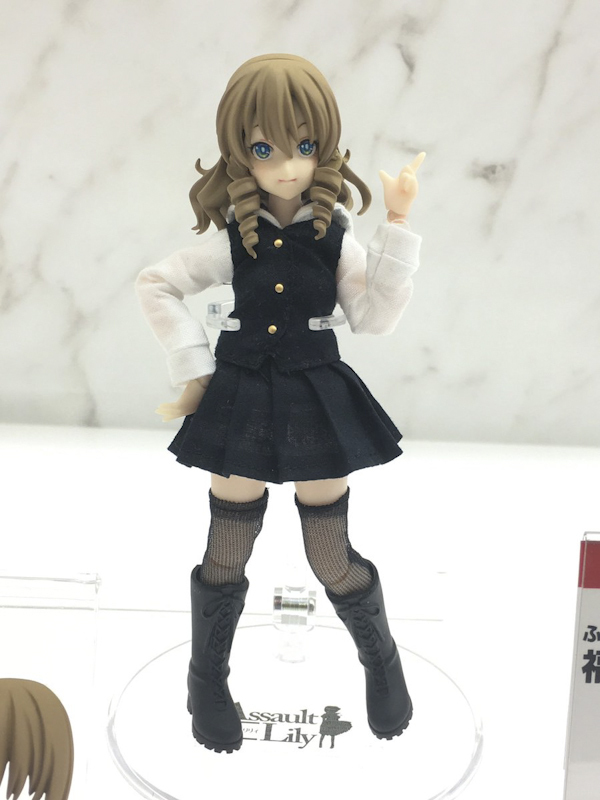 I see not all Azone dolls have the same level of hair rooting, it’s not good as making side pigtails but still good enough and way better then that Tsumugi Kotobuki doll which was one time thing or something like that. I really appreciate it and was very helpful deed. 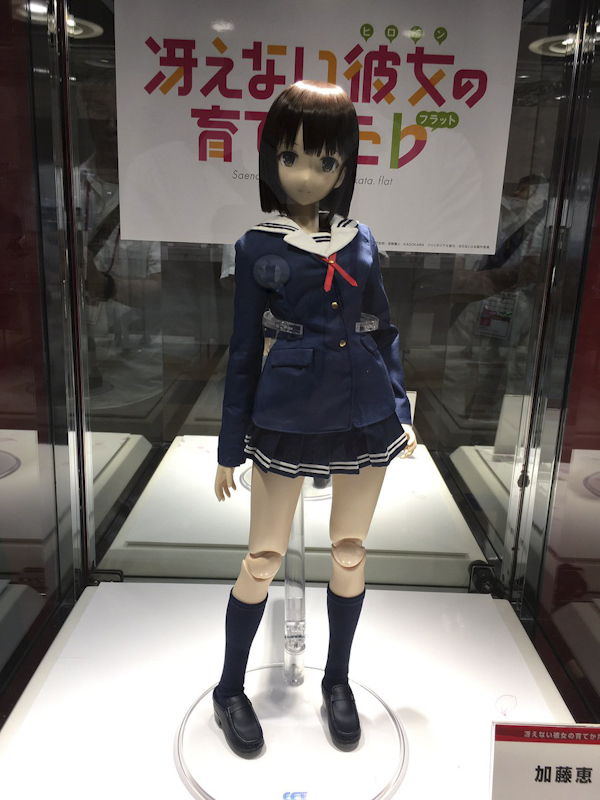 Now I can buy Azone doll and know what to expect:). 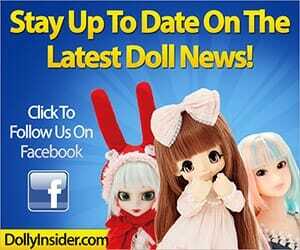 Hope you like whichever doll you choose to get! I can understand where you’re coming from with some characters having elaborate outfits while others have a more simpler style. In this EX-Cute 12th series, the girls are wearing their favorite clothing brand. There are 8 clothing brands listed on Azone site and each have their own style. Some of the brands are edgy while others are causal. I wonder if they’ll introduce new clothing brands? We checked the hair of a couple of our dolls and like ShortNCuddlyAm, we don’t have any dolls with thin hair. 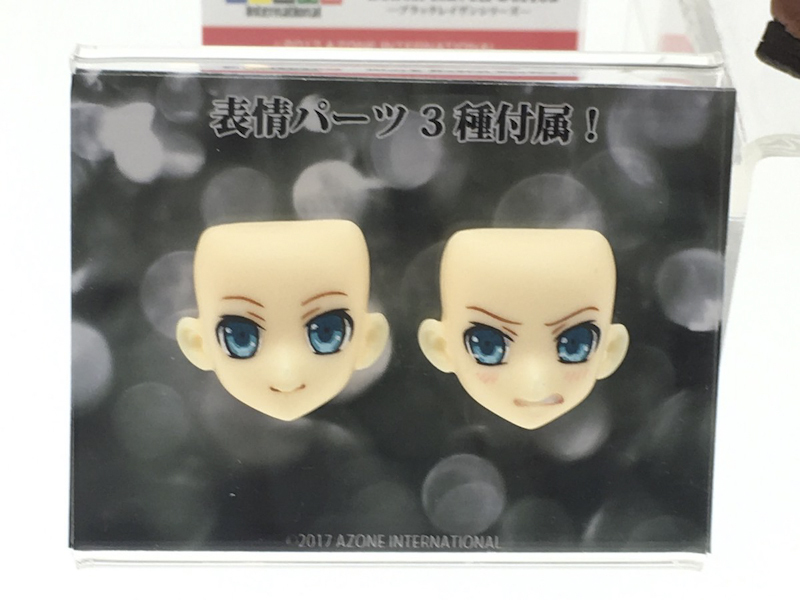 Azone has a notice on their dolls’ product page about thin hair color and seeing through to the skin and pores of the head. 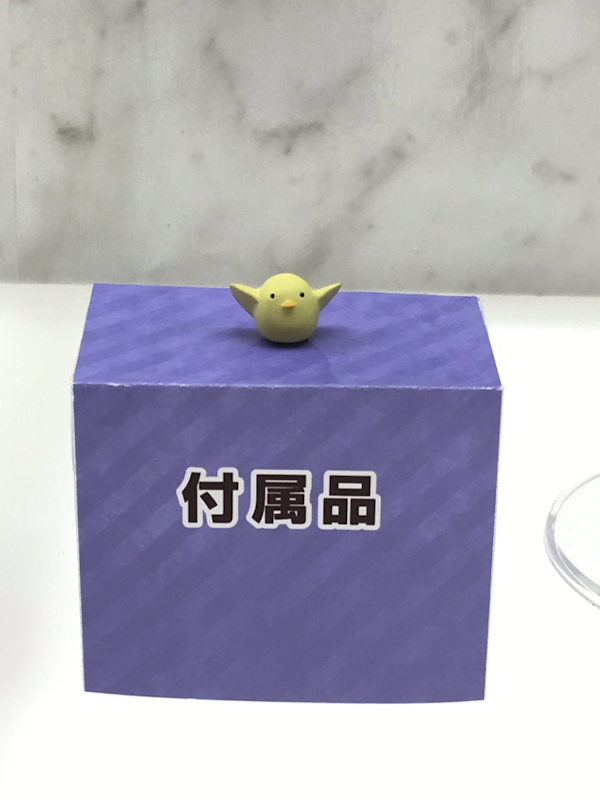 According to them it’s part of the dolls specification. 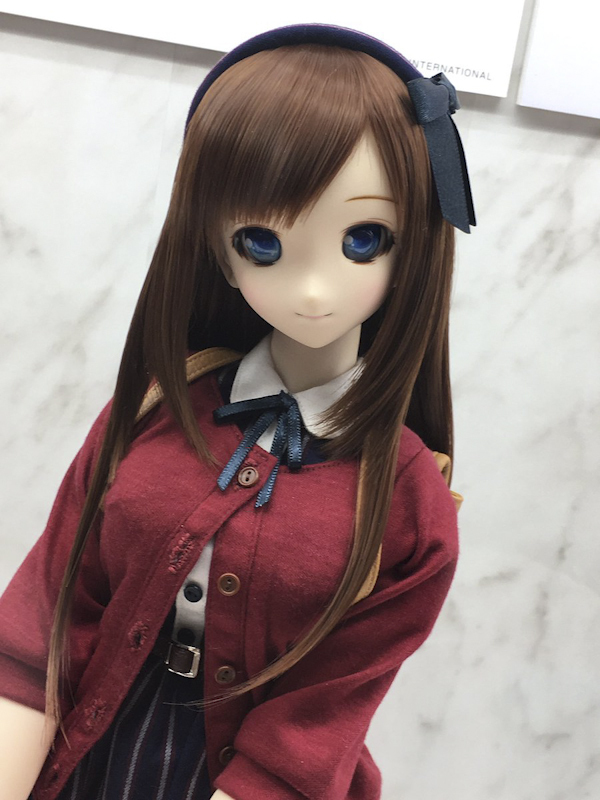 If you decide to get Lien, do come back and let us know what you think about her and the new Pureneemo body. 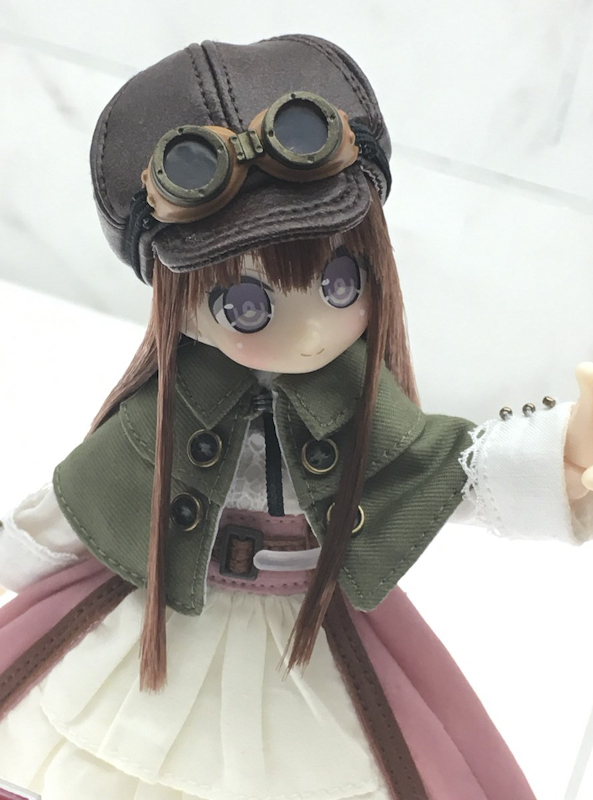 I know about their unique clothing brand (this one of the coolest things ever that can be done with a fashion doll), but my issue isn’t the casual clothing for itself. 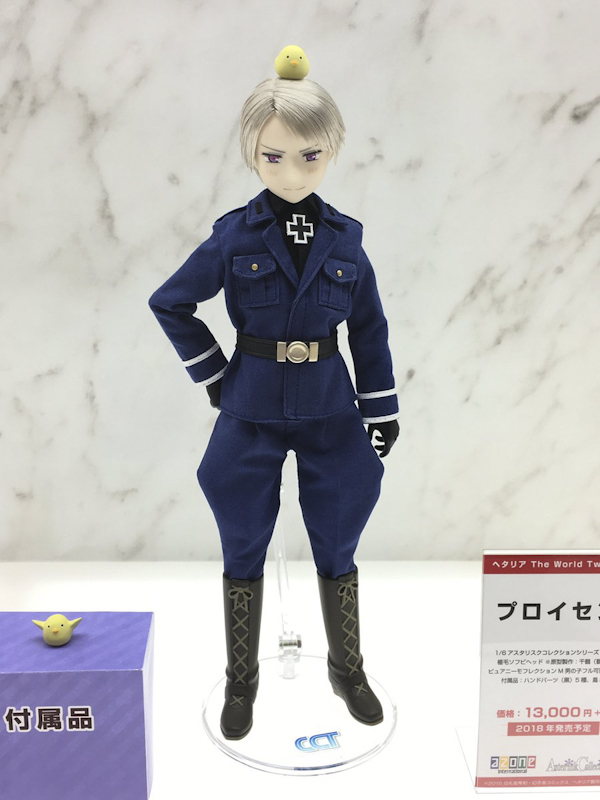 They had casual clothing for Lien before and it was still quite detailed and look on par with the other characters/dolls, however this one is too simple. 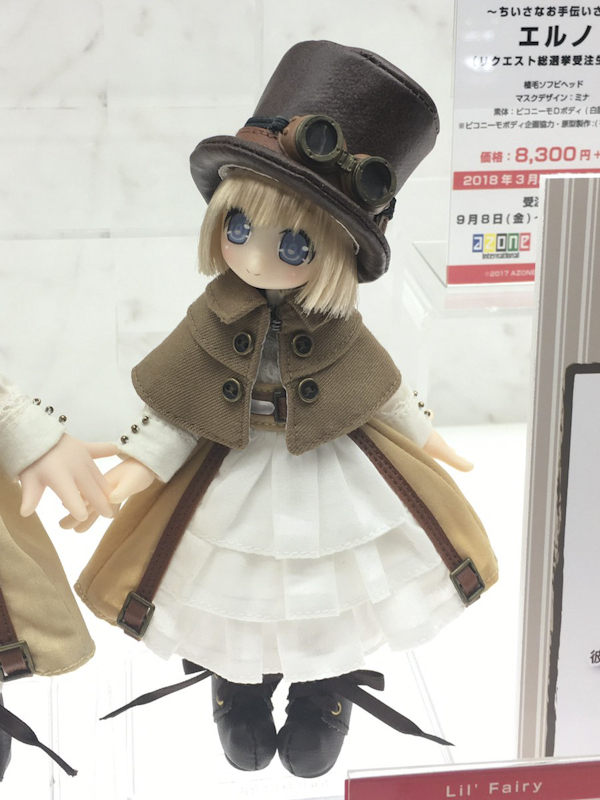 I wish they add some more stuff at least like a bag (which would have been great) so the pricing will be appropriate and won’t look more expensive then it should be when you compare it to the other dolls in the series who shares the same price and have better clothing. 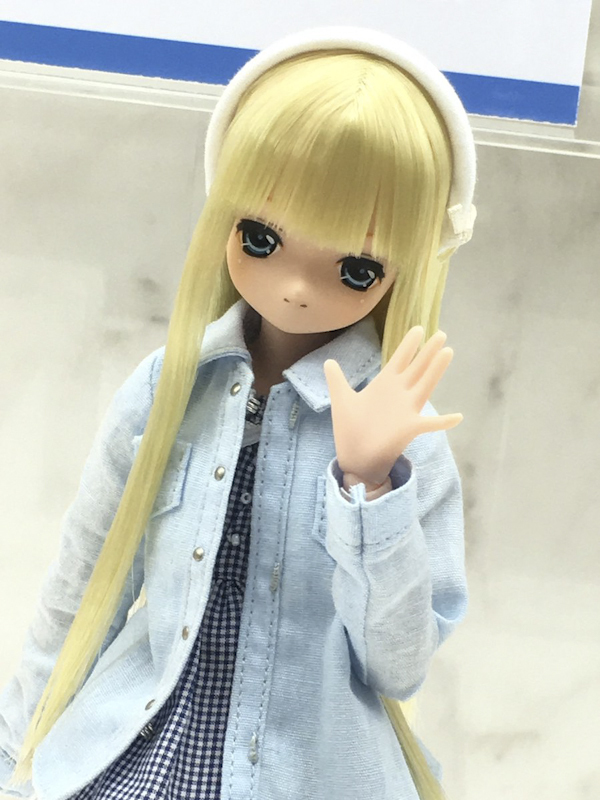 I happend to read through Azone Pure Neemo group in Flickr that Raili will have her own brand:). I wonder how it will be since it seems they tackled all the fashion styles. Oh I gotcha now, Anonym. You bring up some good points. 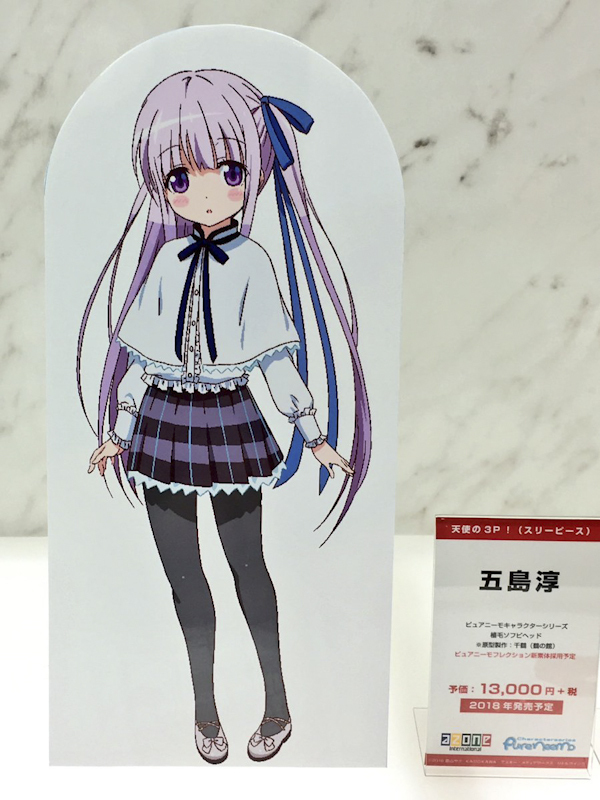 I agree it would be nice if Lien came with a bag or a cute accessory. And thank you for the heads up about Raili’s upcoming favorite brand. Very exciting news, indeed. Thank you for coming back and sharing the Raili news. 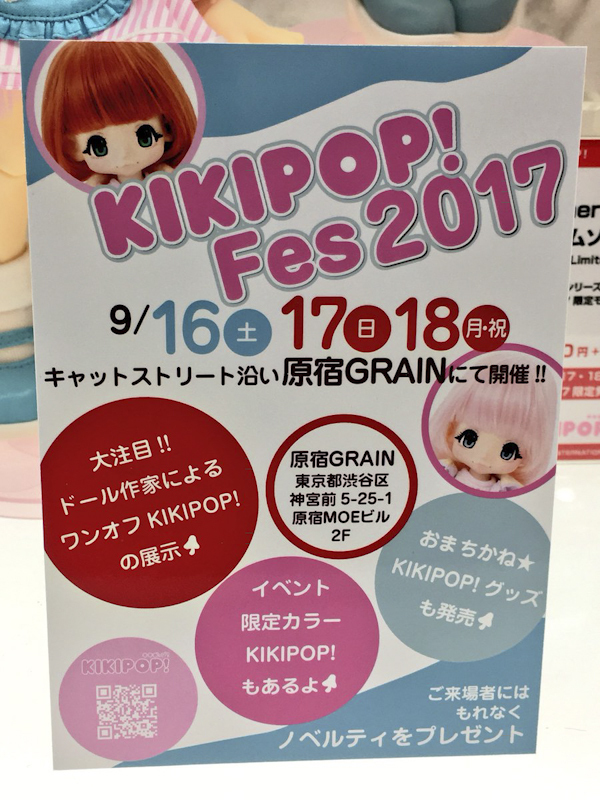 Oh my god the new Kikipop ! are way too perfect ! They are my favorite ever. The outfits are awesome and the colors match perfectly. Their hairstyle is sooo cute. I’m dying and I can’t even pick a favorite. I can’t wait for their release ! I agree. 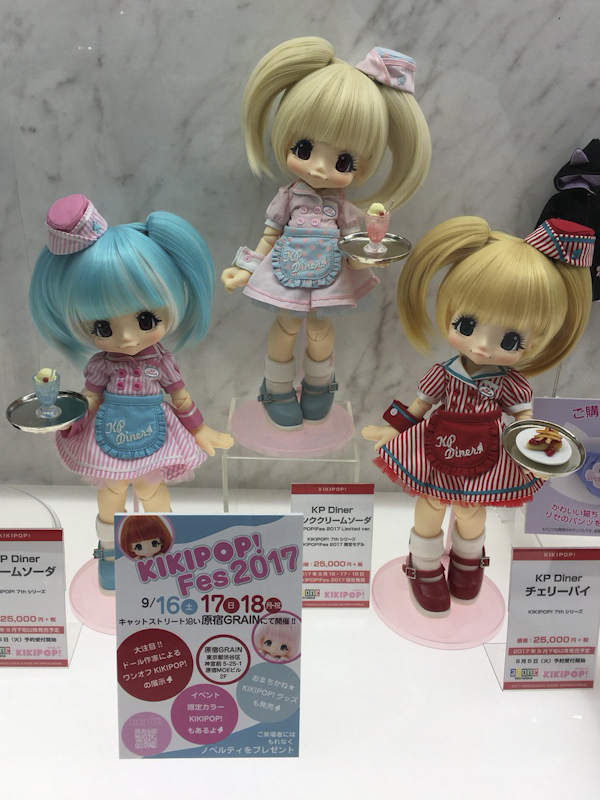 These KIKIPOP! girls are too cute. I’m amazed at how with each release they get cuter & cuter. Picking a favorite is a challenge. Do come back and let me know which one is your favorite. Hi. I love 2 new Lil Fairies: they are very cute. 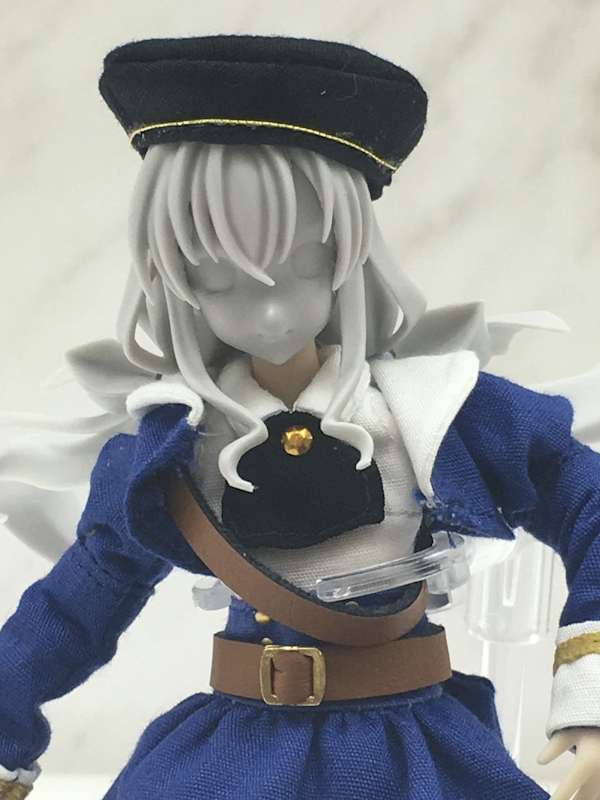 For the rerelease of Vel, Riam and Erunoe, do you know if they are the new body or the old? 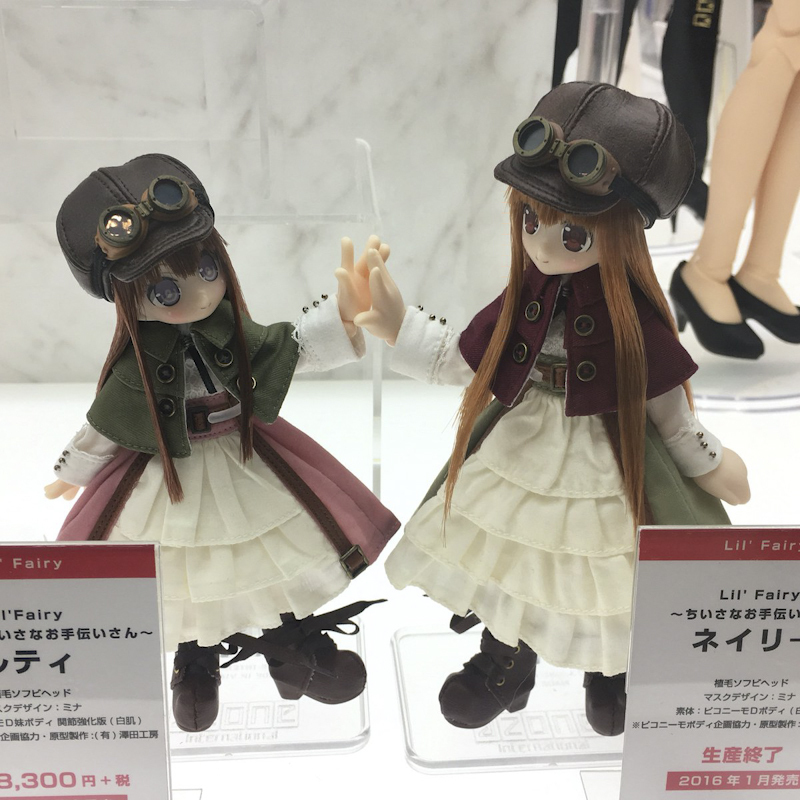 Didn’t Azone rerelease Nelly and Lipu too? Thanks a lot for help.